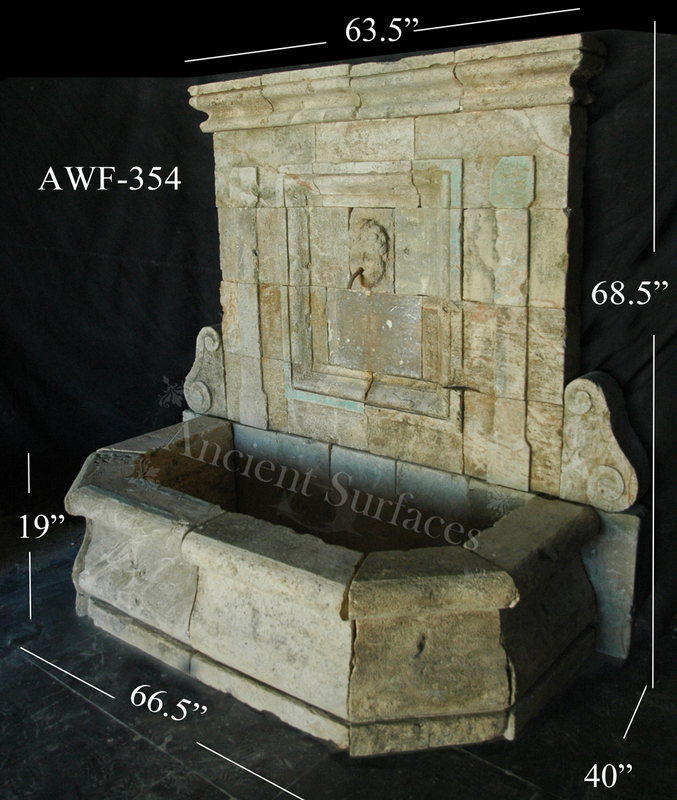 A Custom Carved Stone Fountain by Ancient Surfaces sold to a local dealer. 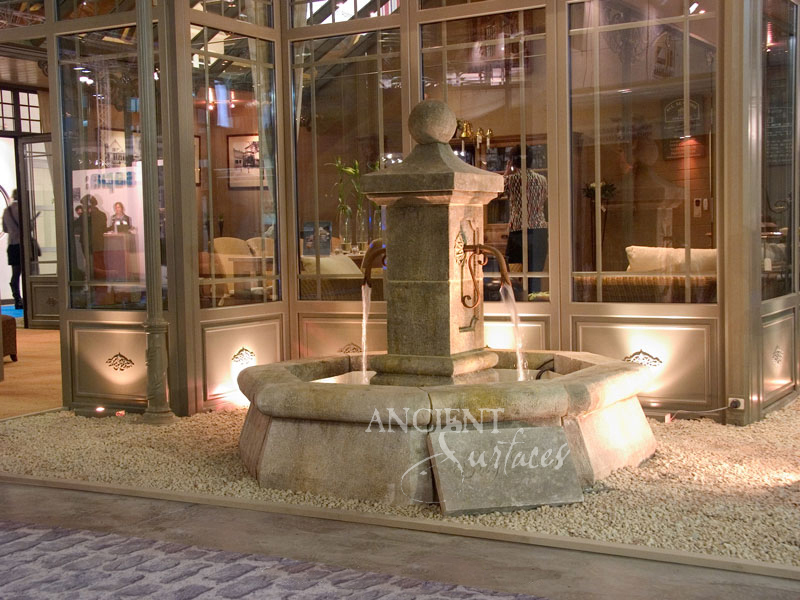 The most important characteristic of indoor courtyard wall fountain design is serenity. 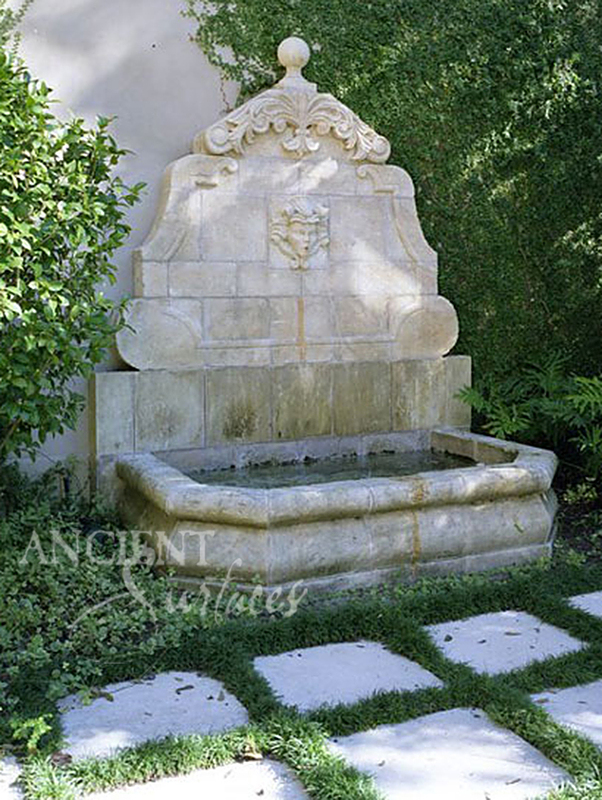 A courtyard wall fountain mounted on a bed of antique stone cladding including salvaged rough iron fencing or even plants is simply breath taking. 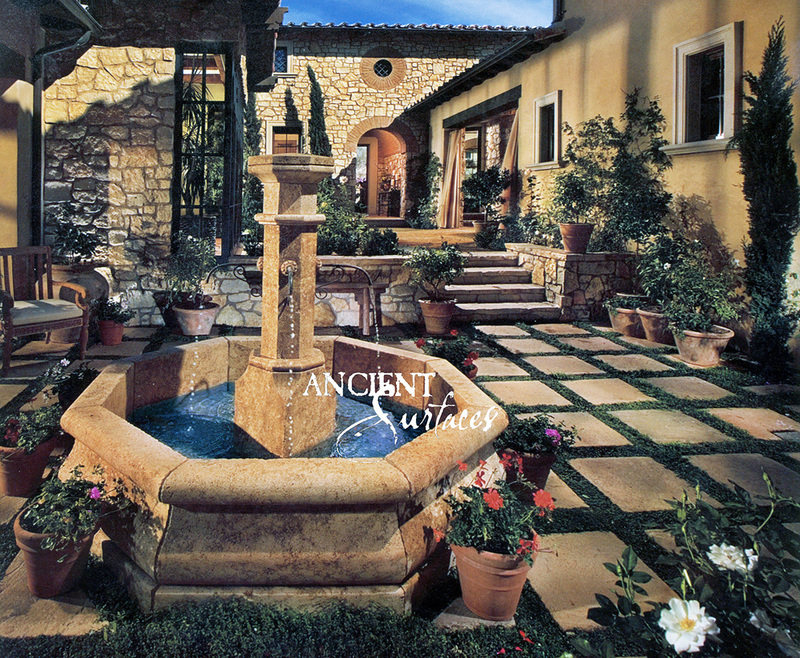 Walls fountains of an indoor courtyard can vary in size as long as they can esthetically and synergistically be layered onto their wall space. 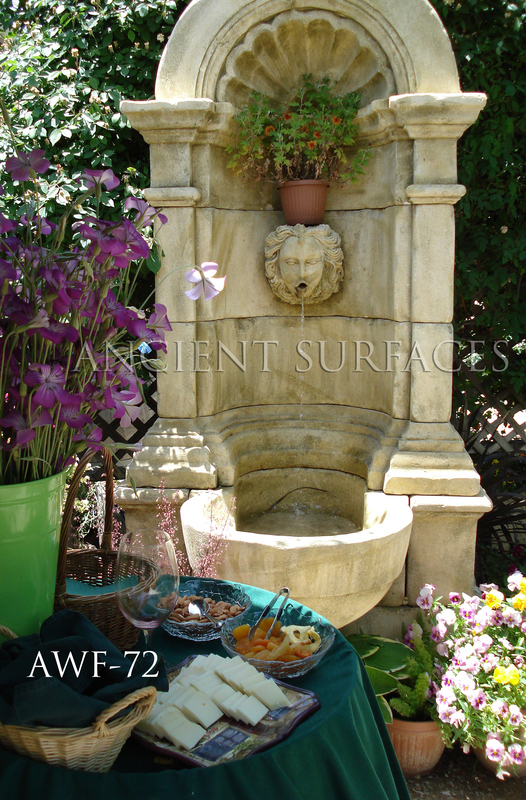 Antique Fountain Sink in an Al Fresco style dining space. 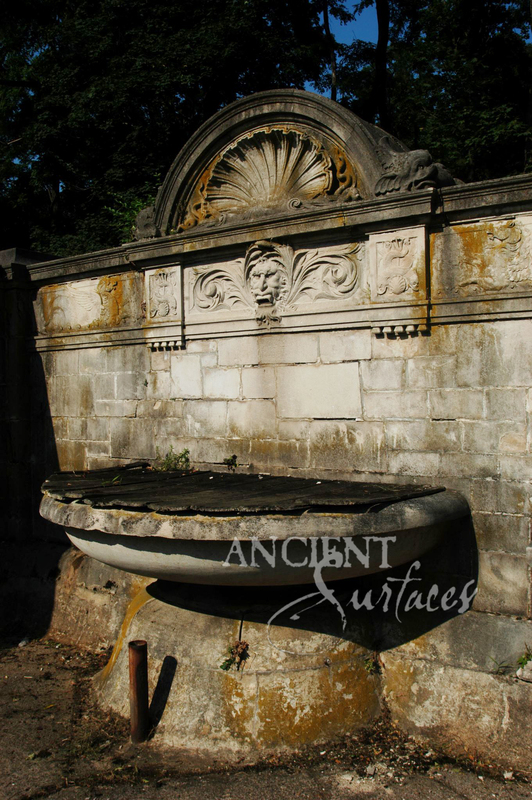 By Ancient Surfaces. 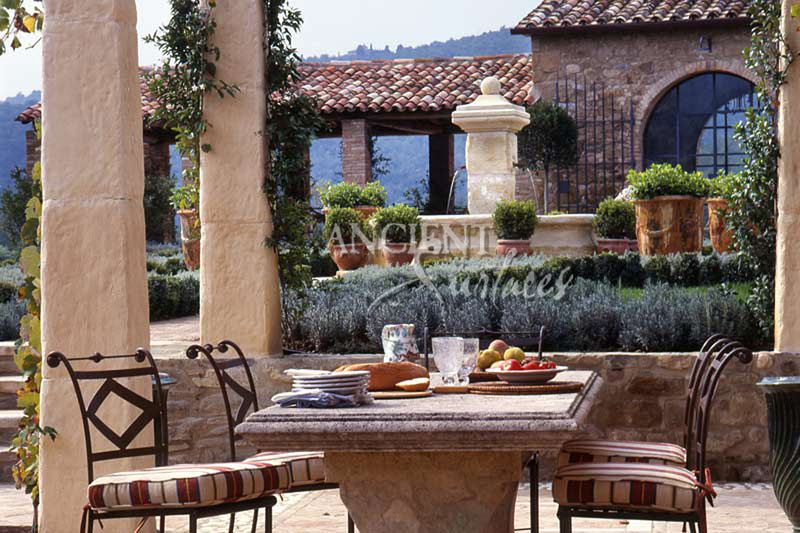 An Enclosing en-plein-air type of outdoor dining spaces can typically be open on all 3 sides and will be sufficient for creating a sense of enclosure. In order to avoid a fortress-like appearance, many homeowners opt to use one wall or partially see-through short wall with a small stone sink of trough fountain padded with a line of thick foliage shrubs or trees. 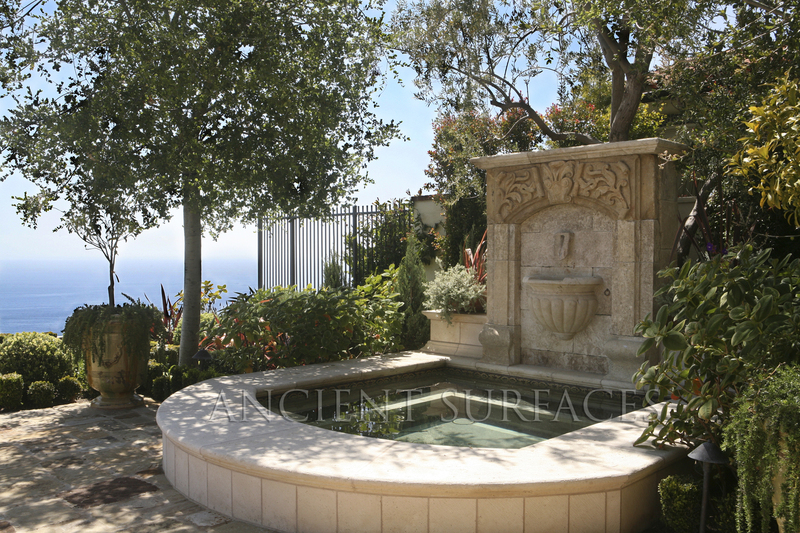 This helps create a sense of greenery and intrigue while welcomes visitors, yet providing privacy for courtyard activities. 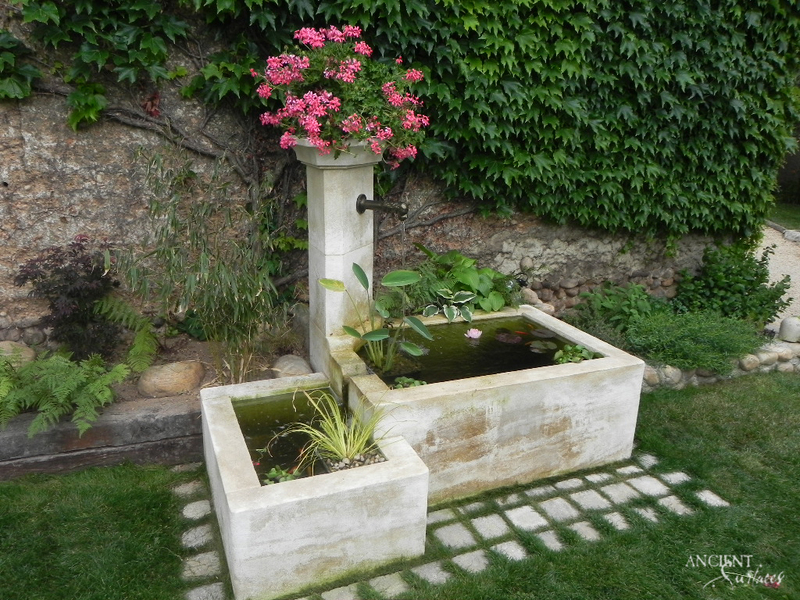 Antique Fountain atop salvaged antique landscaping stone floors and grass. 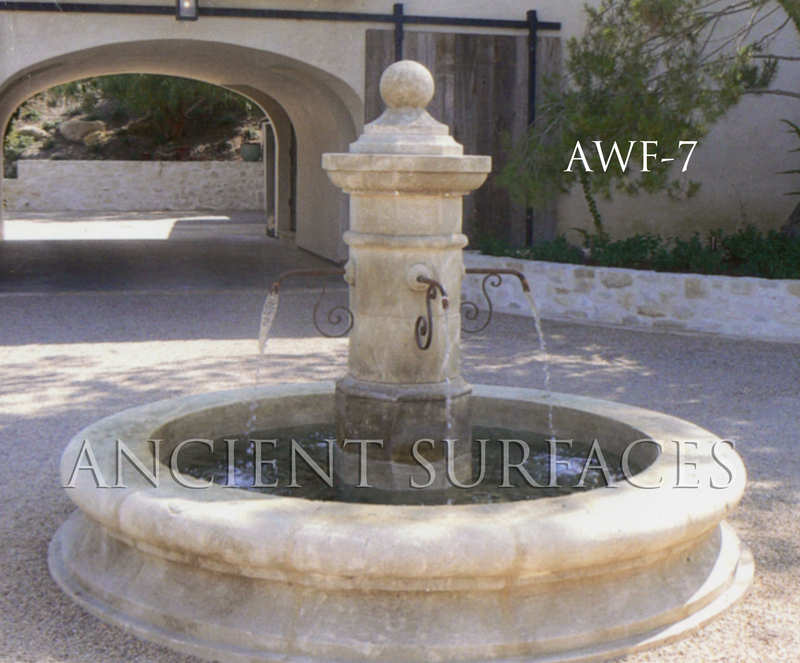 Provided by Ancient Surfaces. A roof or patio cover can be added to a courtyard to further increase the sense of enclosure. However, this may make the garden space feel small and dark. One way to fix this problem is to have windows cut into the walls or fence. 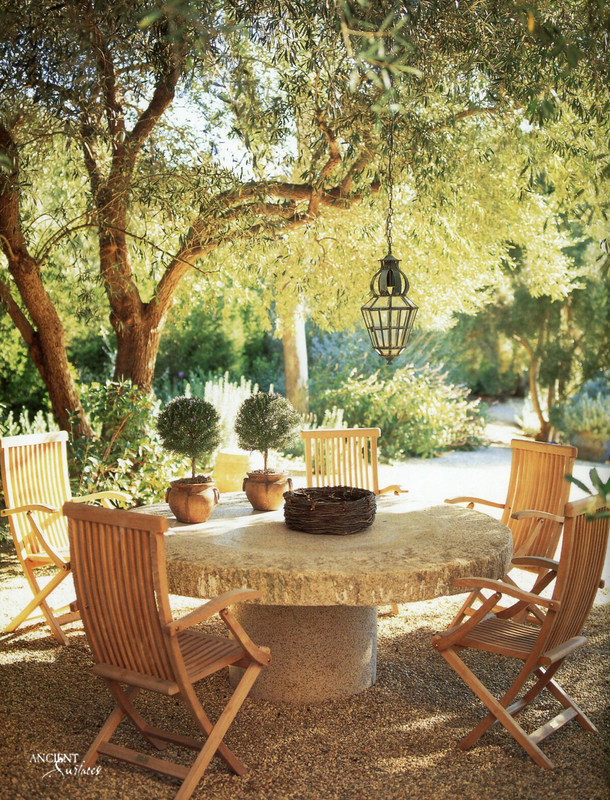 Consult a landscape designer to determine the best way to let the maximum amount of light into your courtyard. 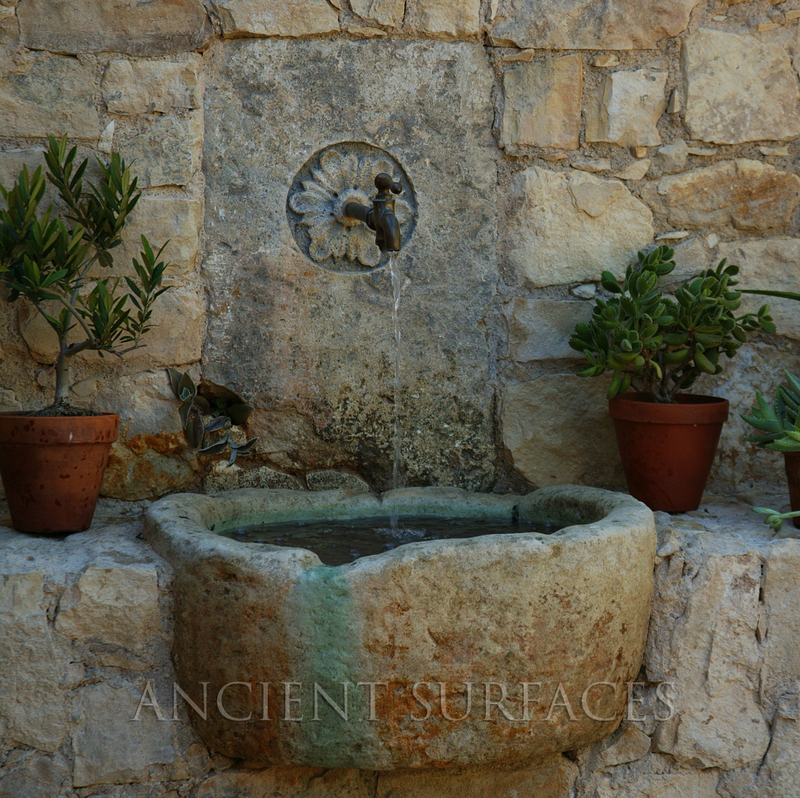 Al Fresco Antique Fountain Sink With Trough installed in an inclosed courtyard in California by Ancient Surfaces. 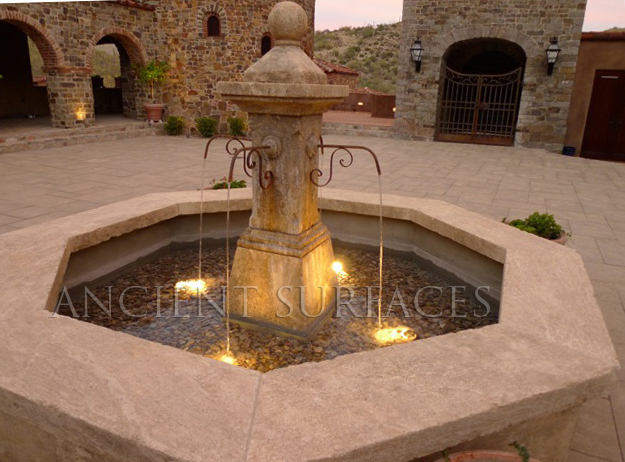 A inclosed courtyard can’t be complete without a central water stone fountain. 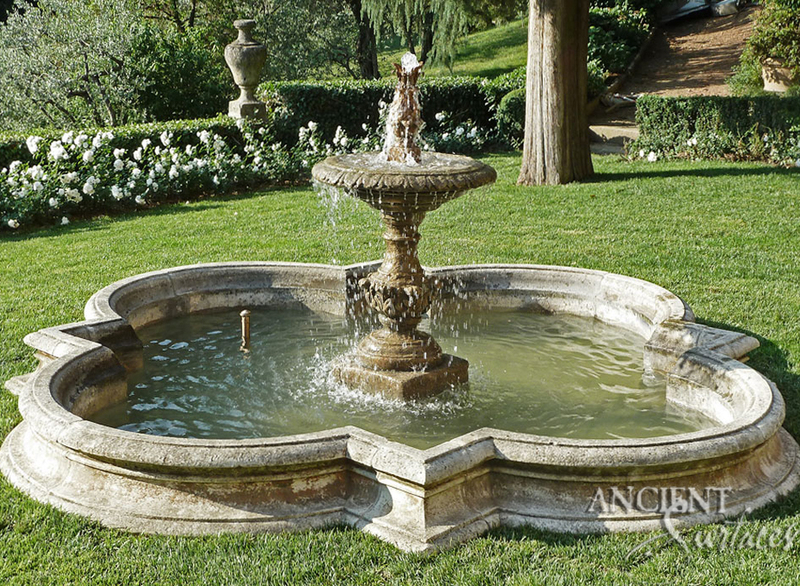 The sound of moving water will help to mask ambient noises such as traffic and neighbors. 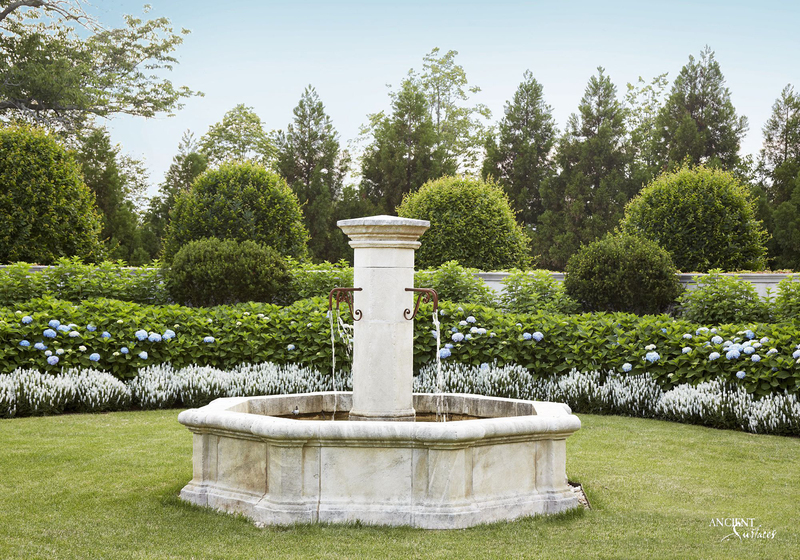 In a formal courtyard design a classically styled fountain can serve as a centerpiece, while in an informal courtyard a wall, or disappearing urn fountain will have the same effect. 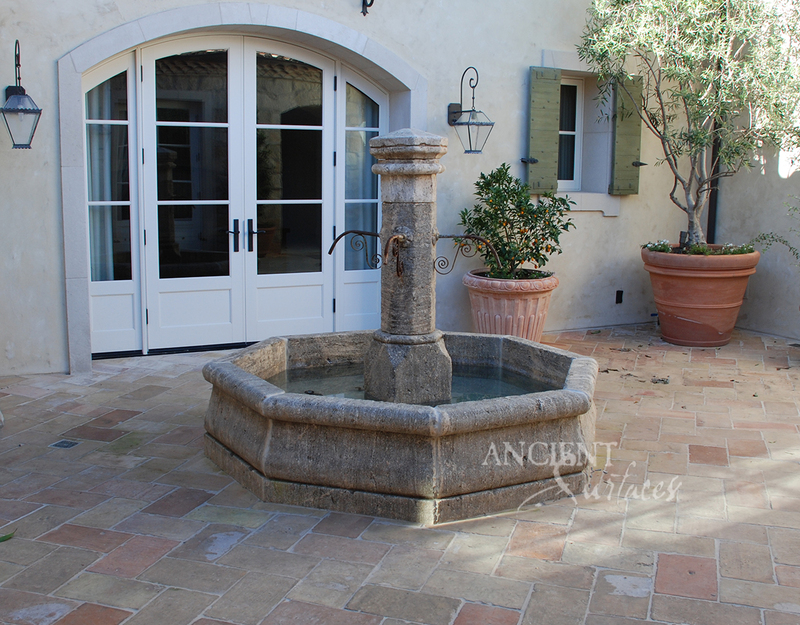 Crystal Cove Showcase House Inclosed Courtyard Stone Fountain. This piece was provided by Ancient Surfaces. 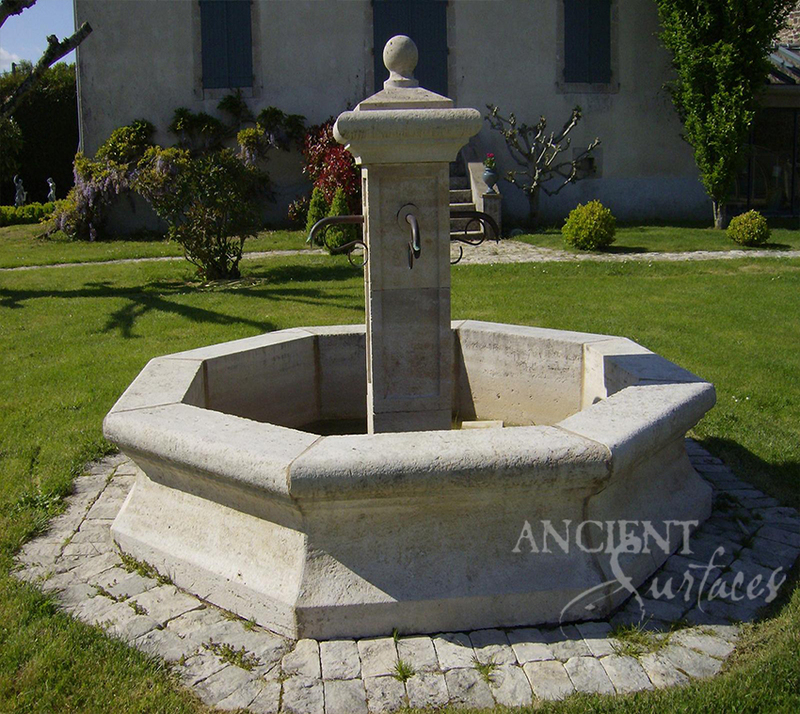 The size of an antique water stone fountain should be proportionate to the size of the courtyard. 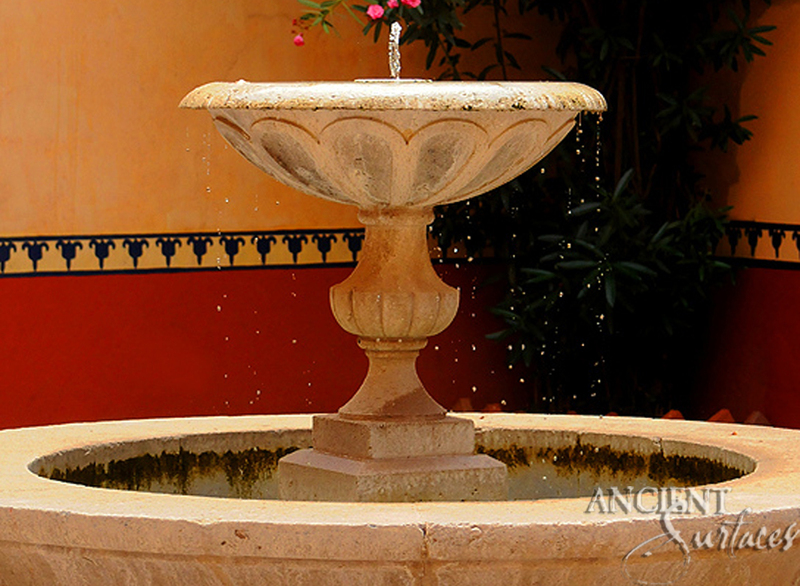 For example, a large tiered Spanish style fountain will visually overpower a small courtyard and produce too much noise for the space. 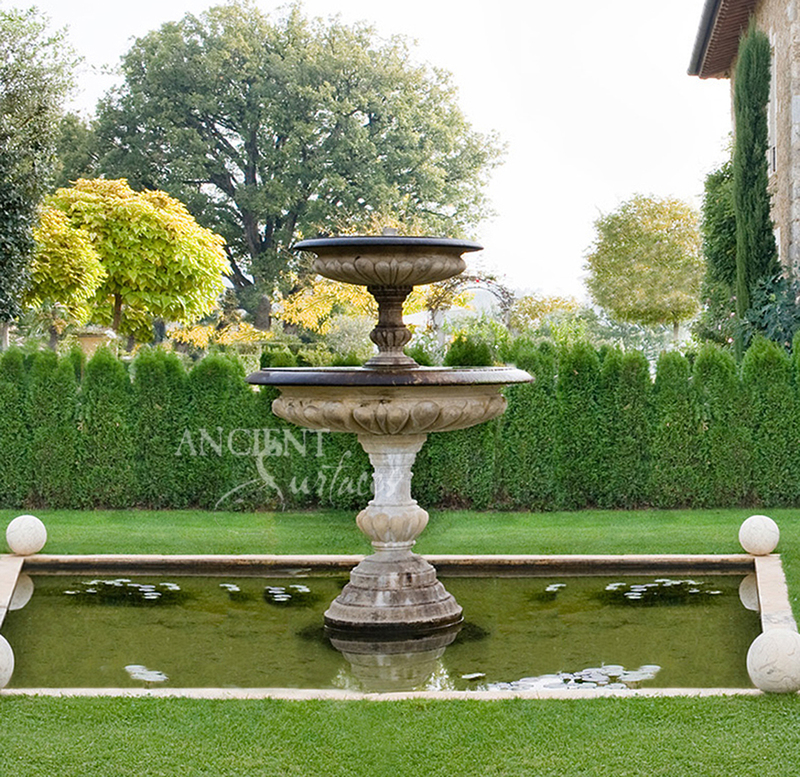 A landscape designer or architect will be able to help you determine the proper scale for your courtyard water feature. 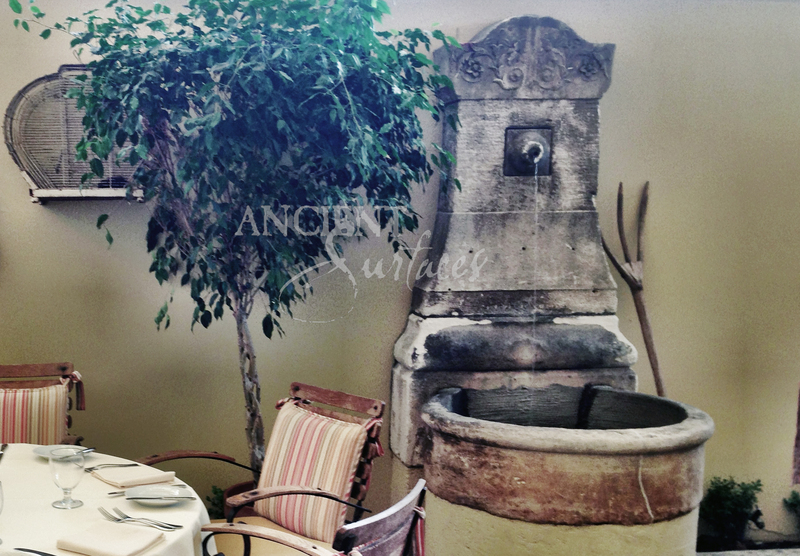 Antique Pool Fountain in an Inclosed Californian Courtyard. 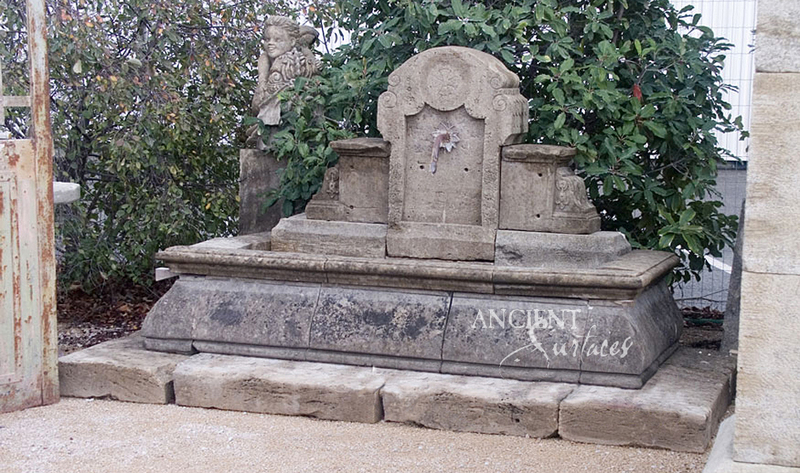 This Piece was Provided by Ancient Surfaces. 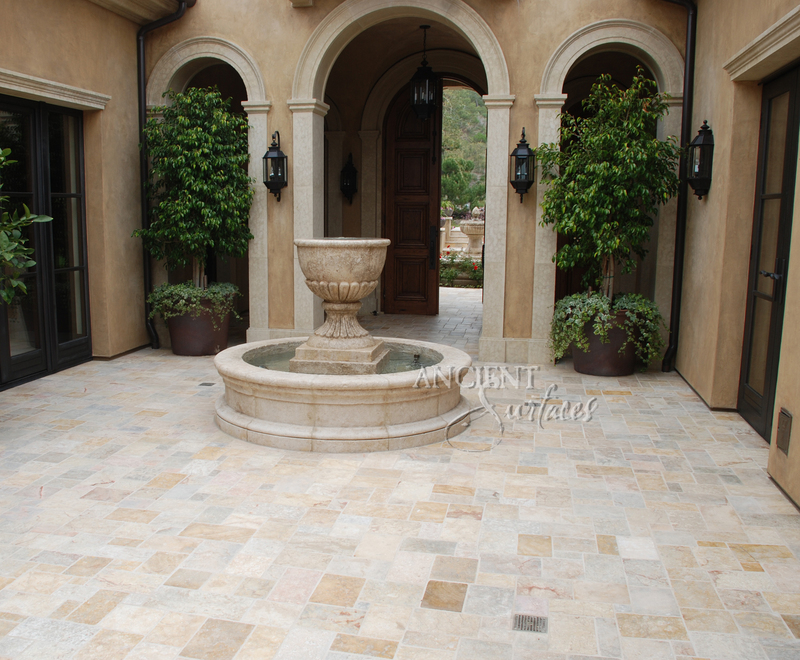 The size of your courtyard will determine how you put the finishing touches on the space. 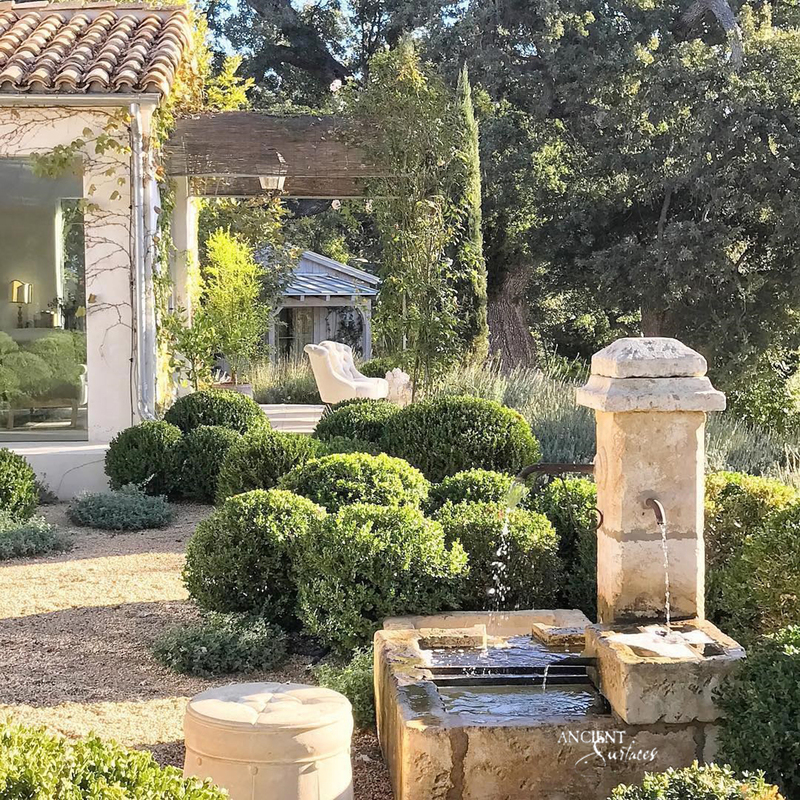 A large courtyard may be able to accommodate an outdoor dining table and chairs and possibly even a fire feature such as a small stone fire pit. 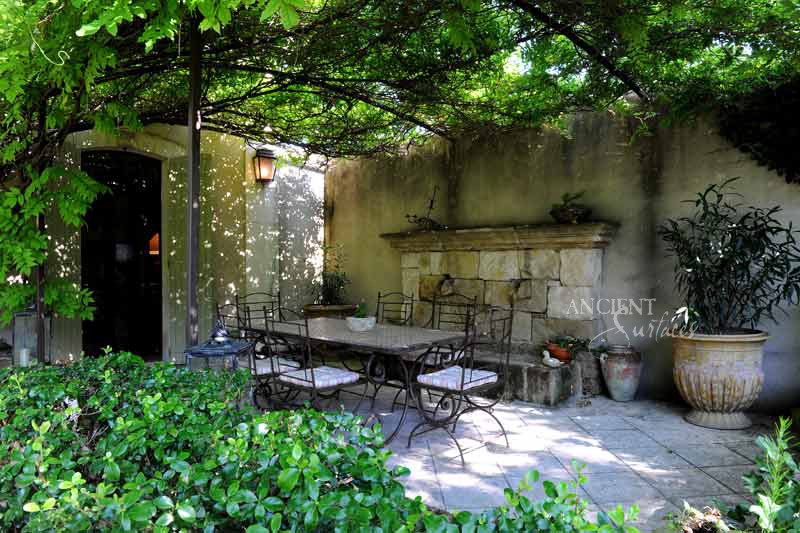 On-the-other-hand, a small courtyard can be easily overwhelmed with accessories. 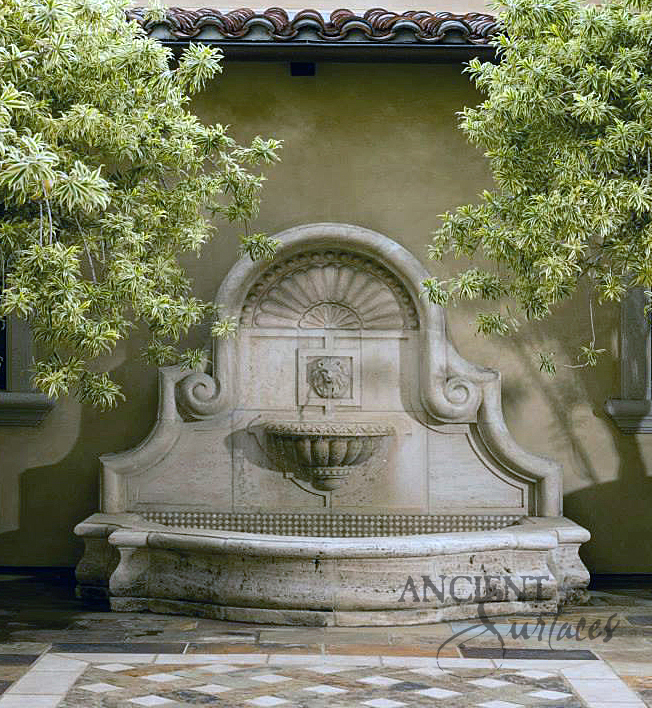 In this case, keep things simple – a basic bench and a few potted plants with a simple wall fountain will do the trick. 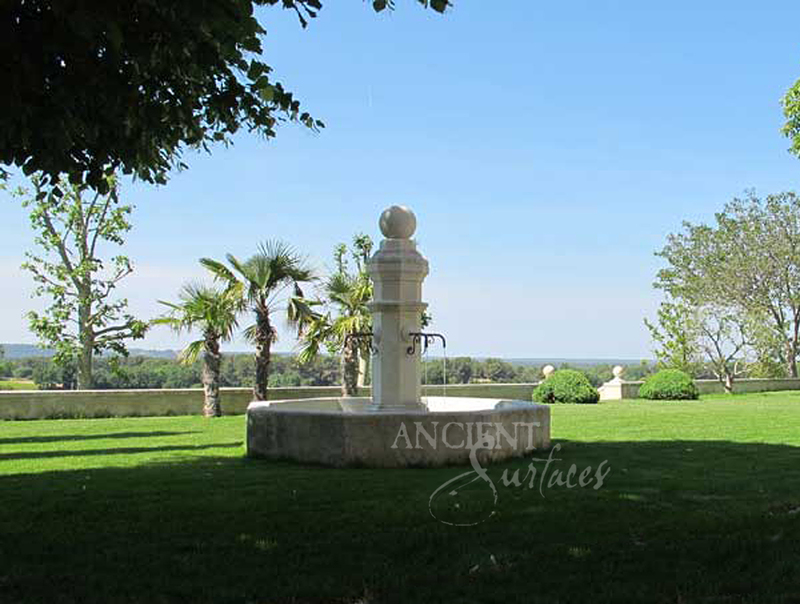 Antique Stone Wellhead Pool Style courtyard Fountain Featuring an antique jar. 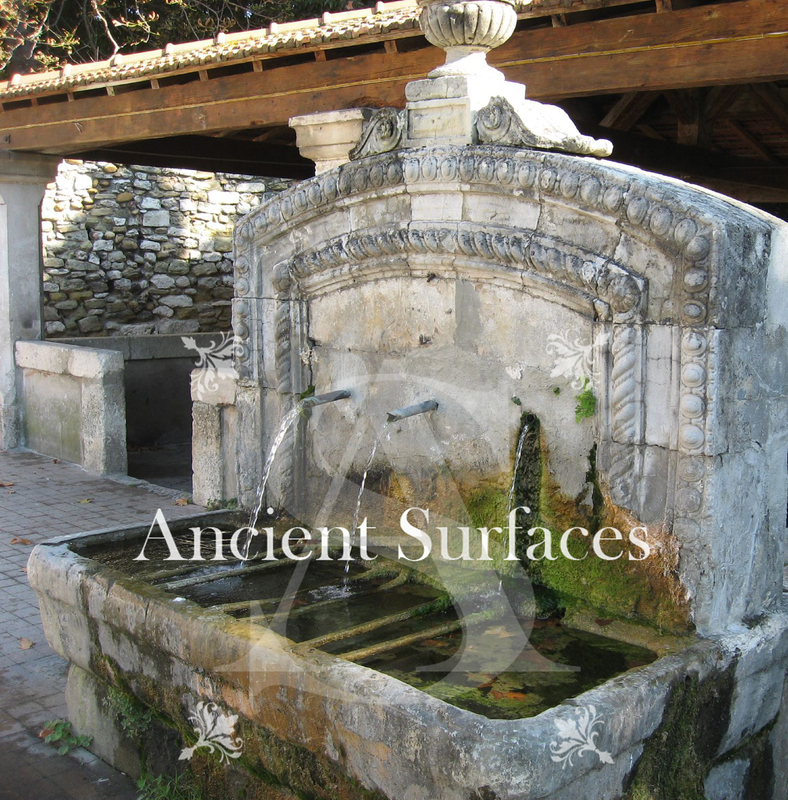 Provided by Ancient Surfaces. 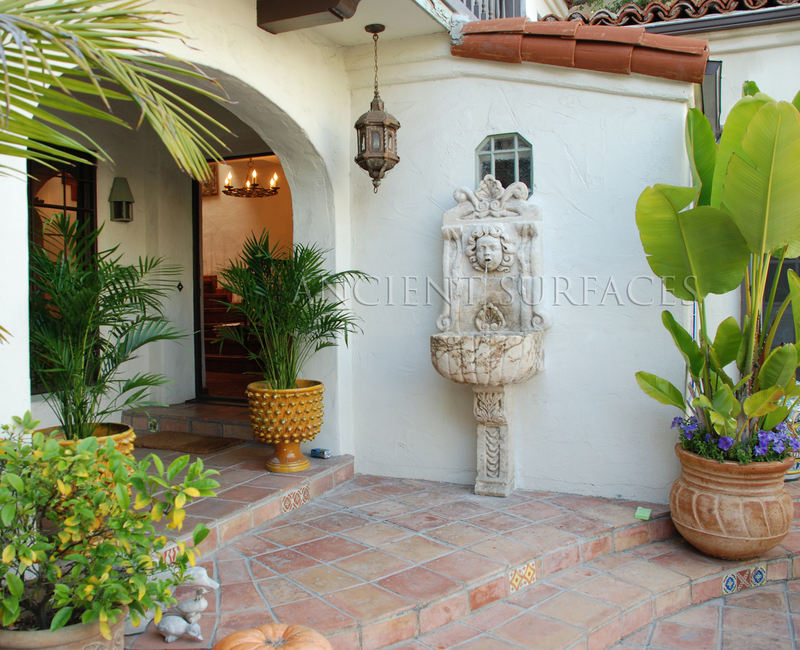 Plants are the key to softening both the inside and outside of courtyard walls. 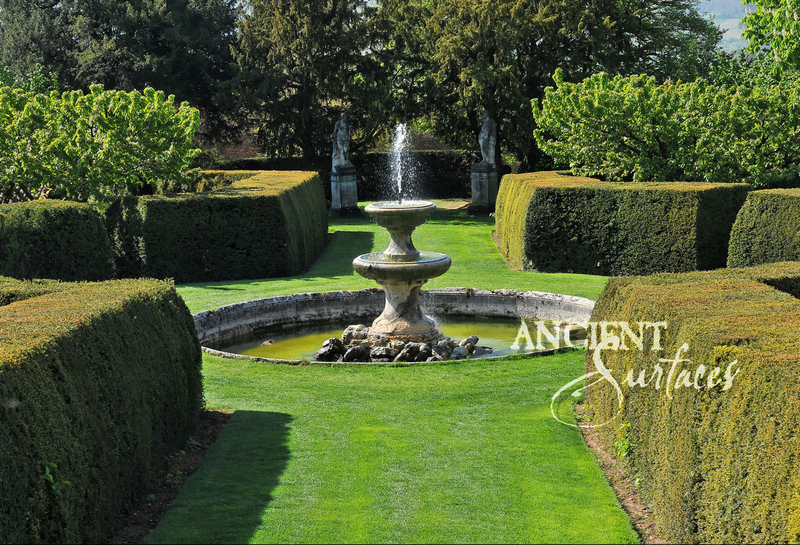 Hedges and ornamental grasses can be grown along the walls, or a grouping of container gardens can be placed in a corner. Climbing plants are great because they will grow up and over the walls. If you live in a climate that allows, bougainvillea will add a nice pop of tropical color. 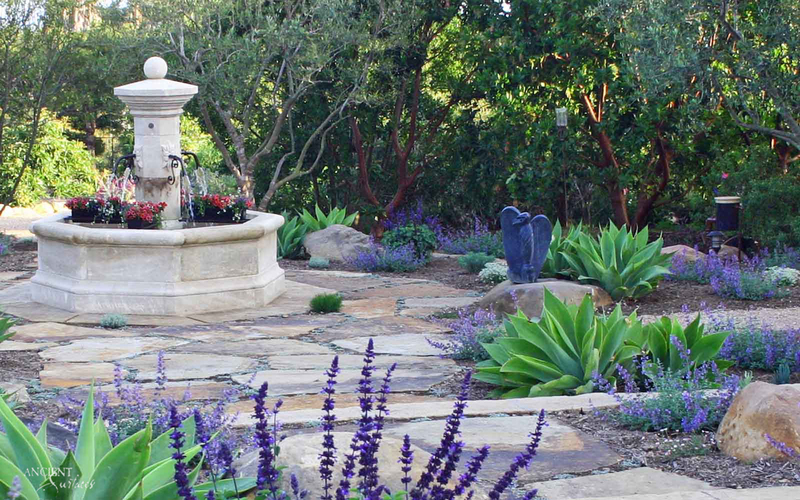 The plants you choose can help establish a theme in your courtyard. For example, ferns and evergreens will create a South East Asian vibe. 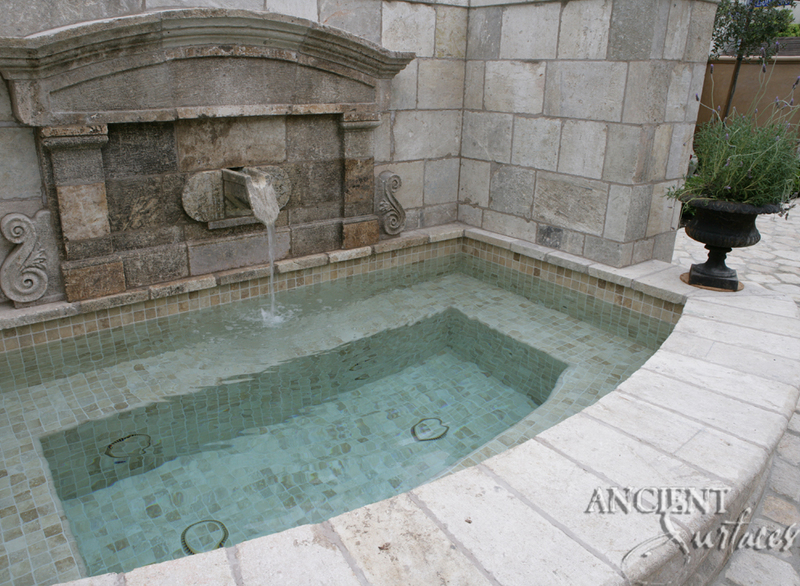 A Massive 16 Feet Long Pool Stone Fountain Doubling as an Outdoor Jacuzzi Spa. 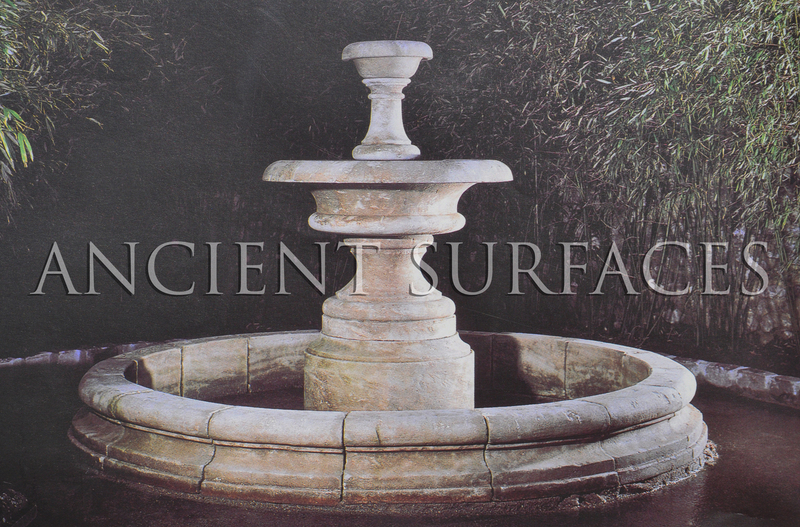 Provided by Ancient Surfaces. Finally, a courtyard needs lighting. First and foremost all pathways should be lit for safety. 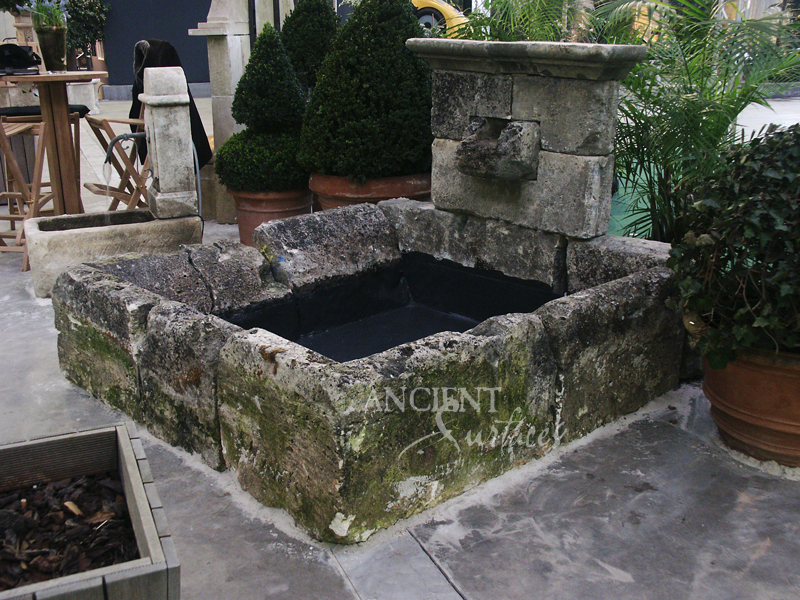 Then you can think about lighting your water feature to make it a nighttime focal point. And last but not least, you can add sparkling string lights or Moroccan inspired lanterns for ambiance. 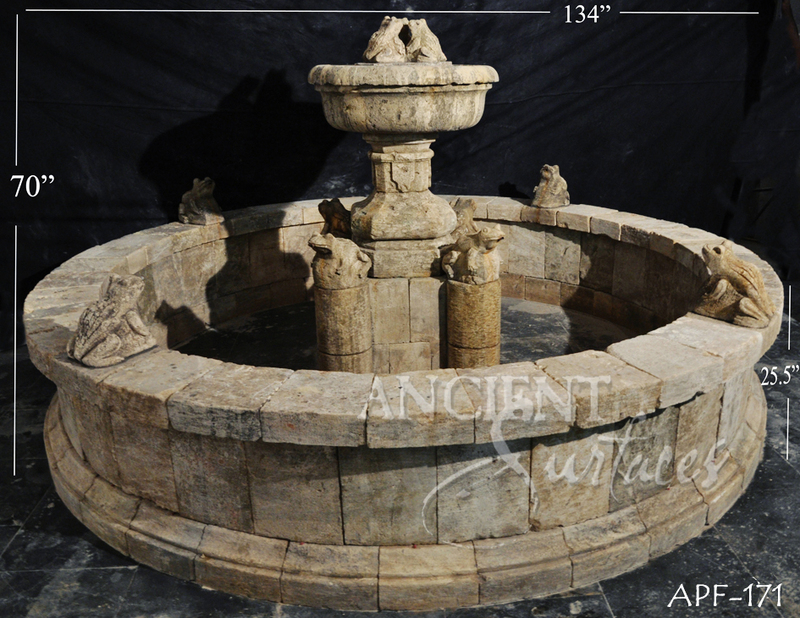 Antique Octagonal Stone Courtyard Fountain Featuring Pool lights. 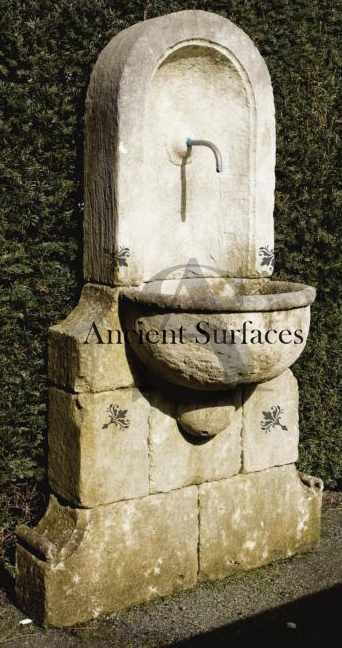 Provided by Ancient Surfaces. 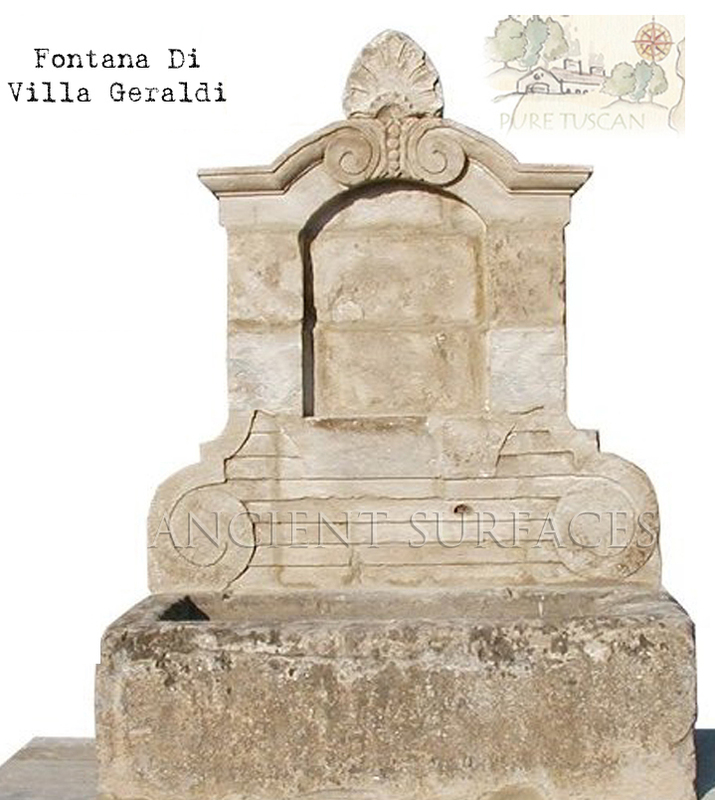 A fountain (from the Latin word “fontis” meaning a source or spring) is a piece of architecture which pours water into a basin or jets it into the air to supply drinking water and/or for a decorative or dramatic effect. 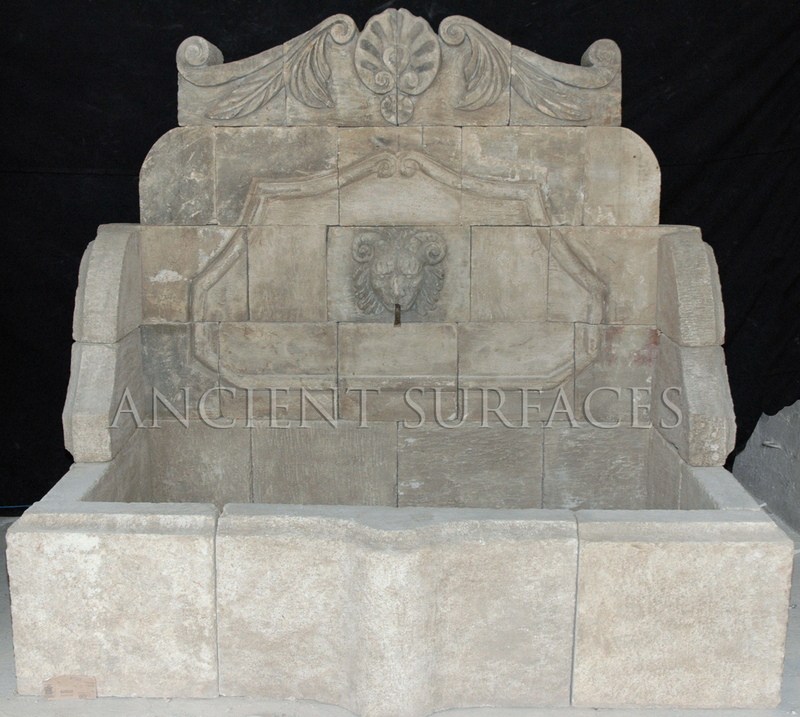 Antique lion head wall fountain by Ancient Surfaces. 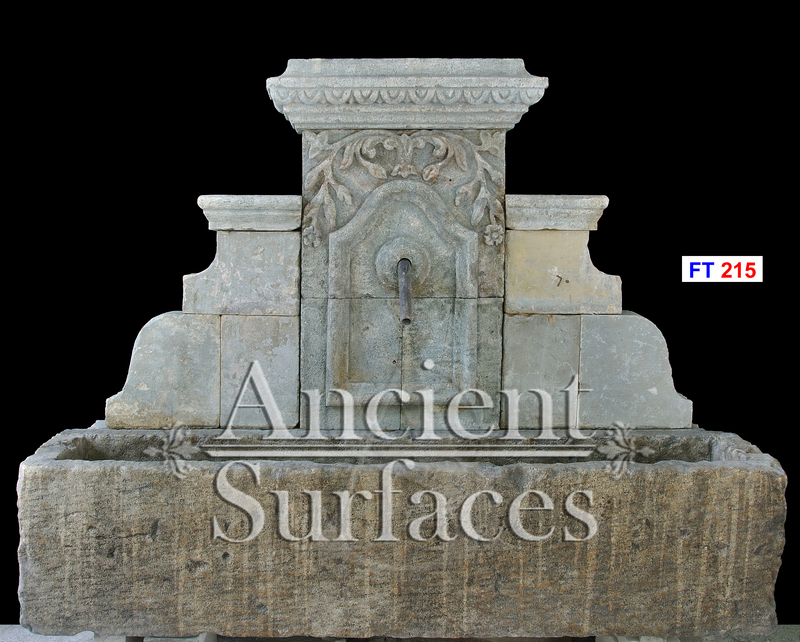 Antique Cherub head wall fountain by Ancient Surfaces. 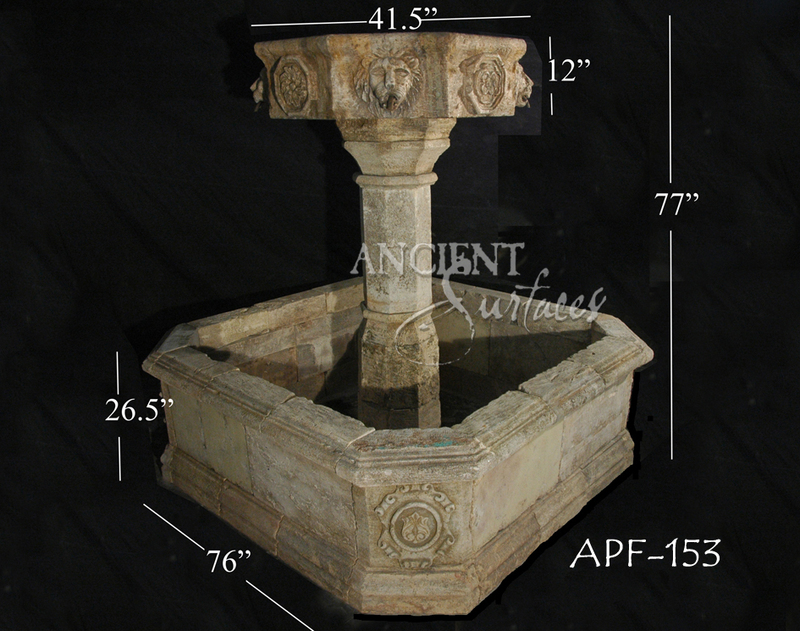 Antique Octagonal Stone Fountain by Ancient Surfaces. 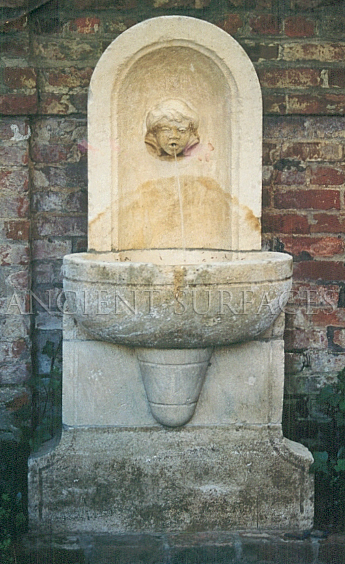 In addition to providing drinking water, fountains were used for decoration and to celebrate their builders. 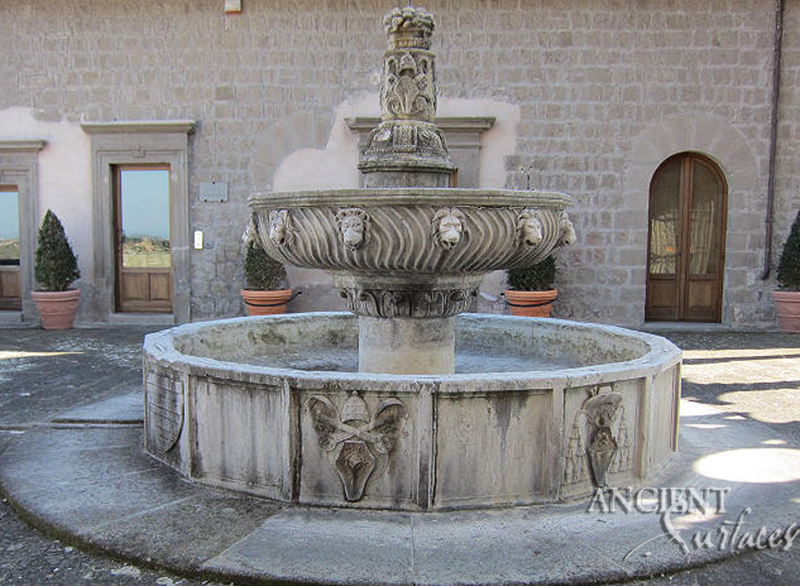 Roman fountains were decorated with bronze or stone masks of animals or heroes. 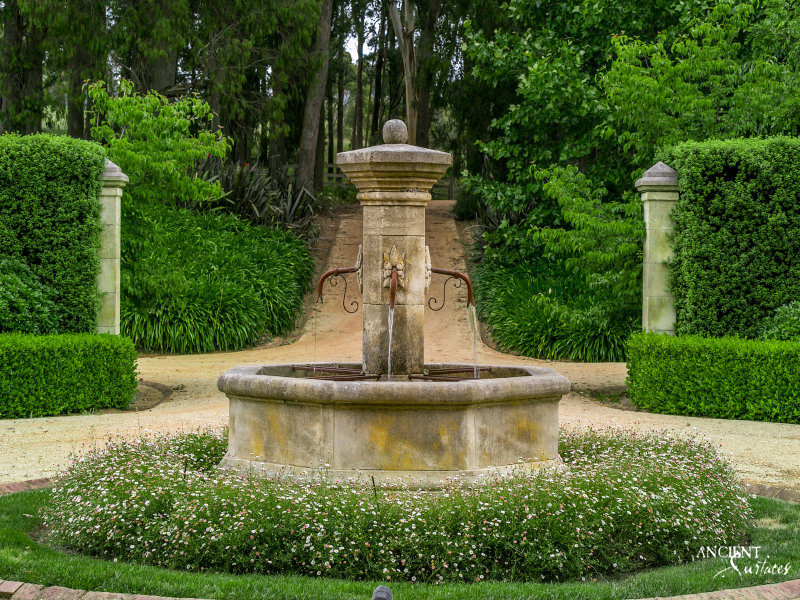 In the Middle Ages, Moorish and Muslim garden designers used fountains to create miniature versions of the gardens of paradise. 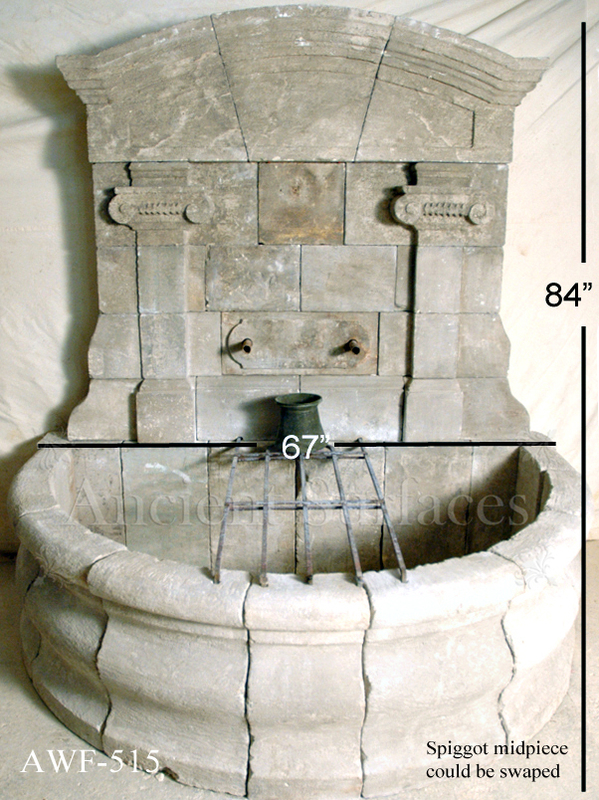 Ancient civilizations built stone basins to capture and hold precious drinking water. 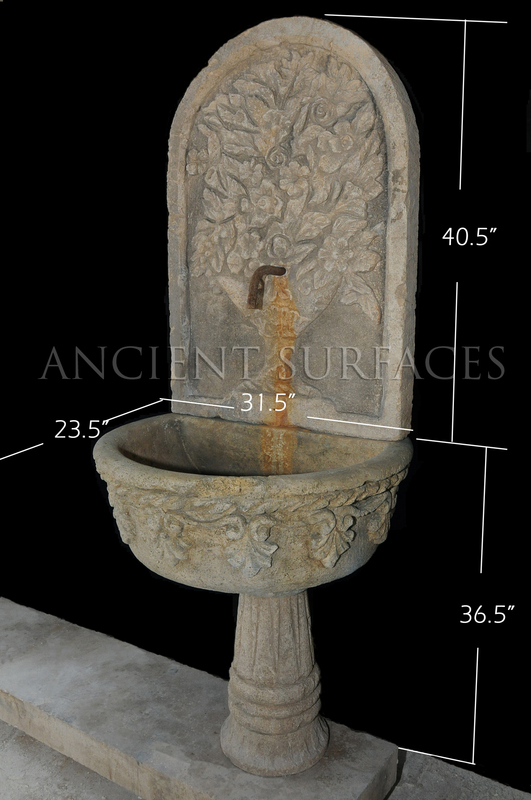 A carved stone basin, dating to around 2000 BC, was discovered in the ruins of the ancient Sumerian city of Lagash. 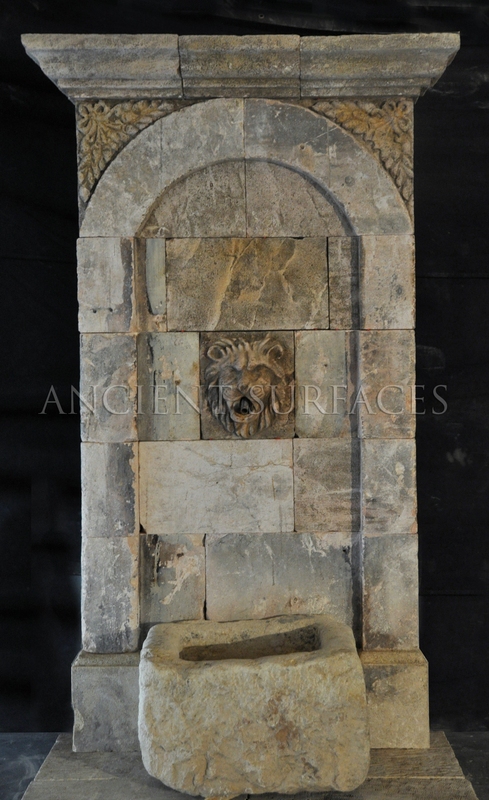 Antique double headed lion wall fountain by Ancient Surfaces. The ancient Assyrians constructed a series of basins in the gorge of the Comel River, carved in solid rock, connected by small channels, descending to a stream. 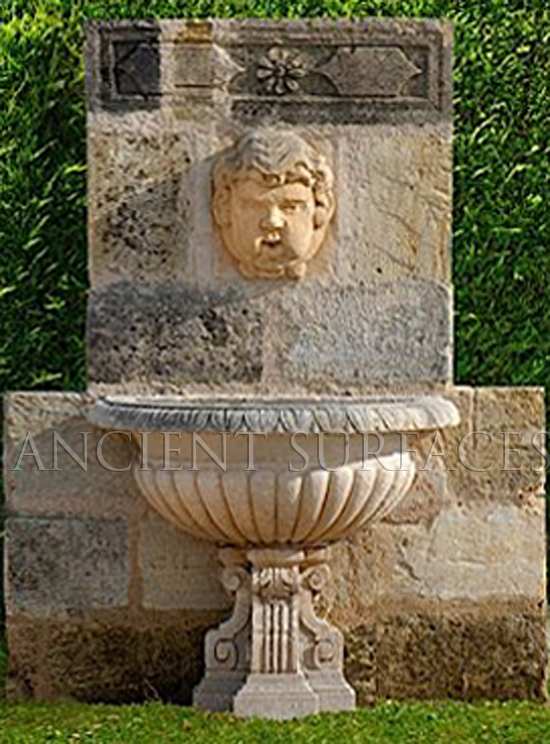 Antique Bacchus head wall fountain by Ancient Surfaces. 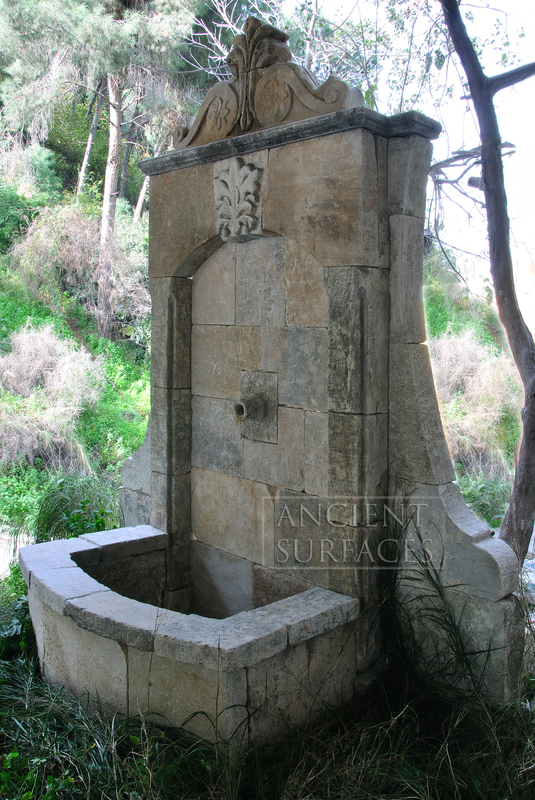 The lowest basin was decorated with carved reliefs of two lions. 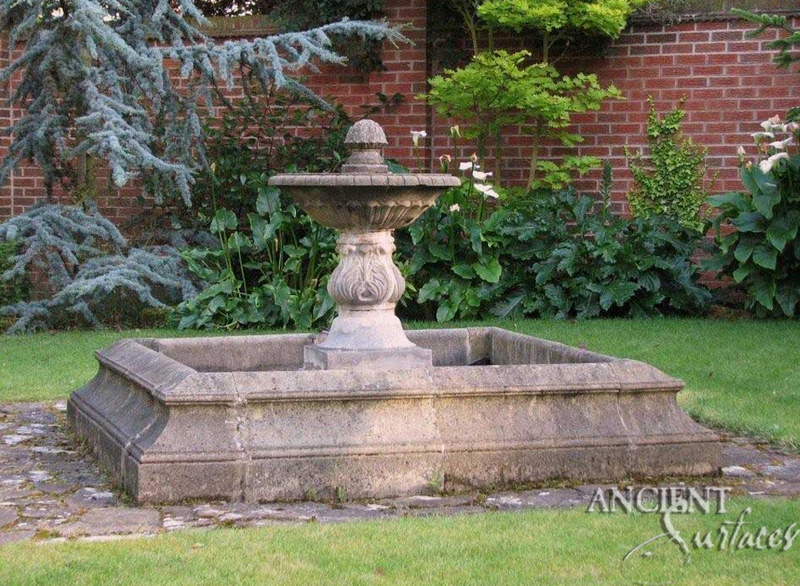 The ancient Egyptians had ingenious systems for hoisting water up from the Nile for drinking and irrigation, but without a higher source of water it was not possible to make water flow by gravity, and no Egyptian fountains or pictures of fountains have been found. 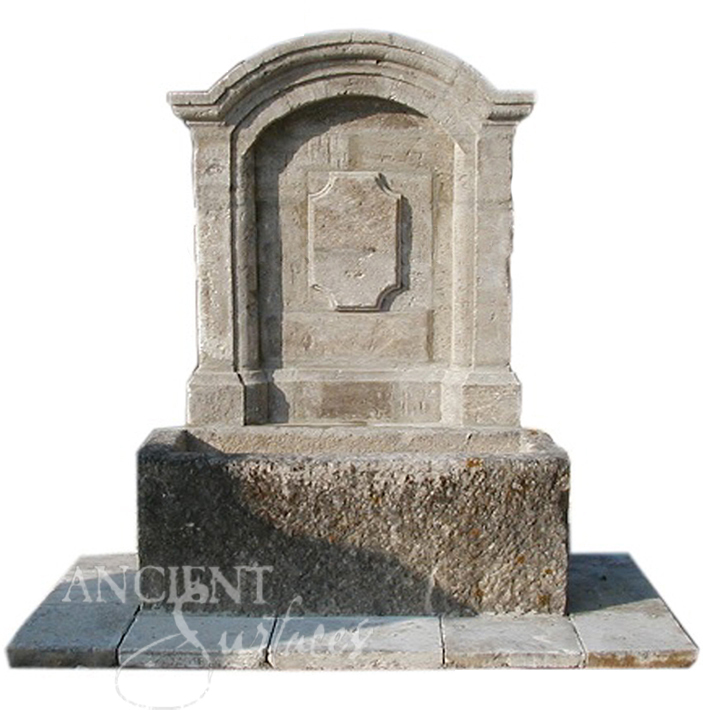 Antique Medieval wall fountain by Ancient Surfaces. 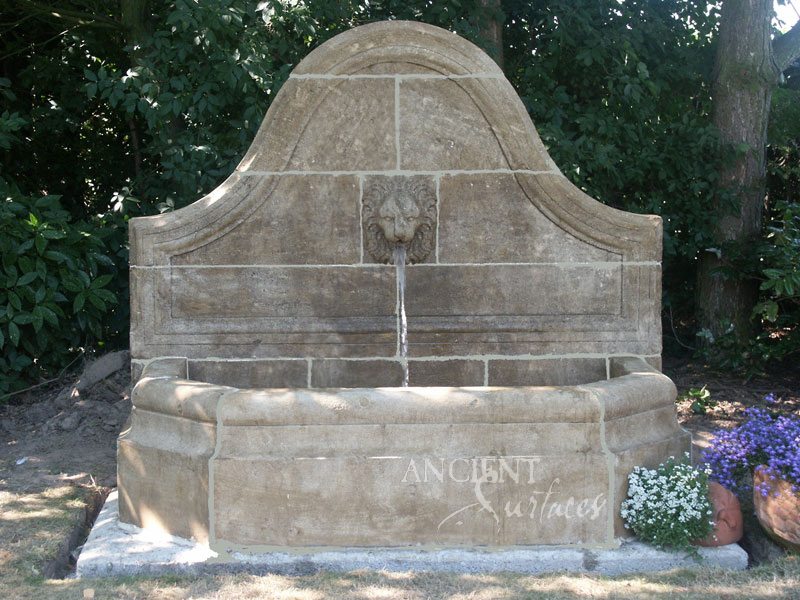 The ancient Greeks were apparently the first to use aqueducts and gravity-powered fountains to distribute water. 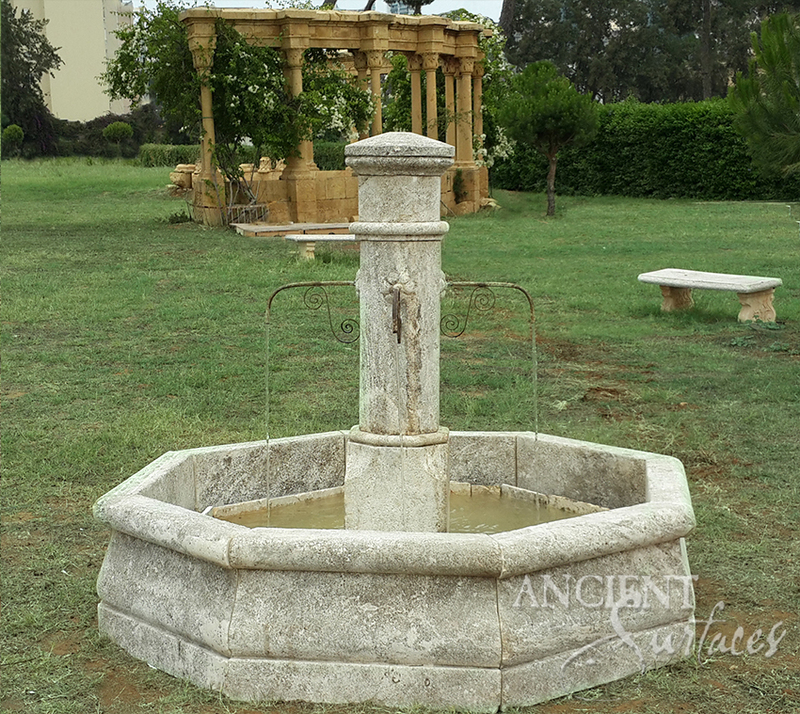 According to ancient historians, fountains existed in Athens, Corinth, and other ancient Greek cities in the 6th century BC as the terminating points of aqueducts which brought water from springs and rivers into the cities. In the 6th century BC the Athenian ruler Peisistratos built the main fountain of Athens, the Enneacrounos, in the Agora, or main square. It had nine large cannons, or spouts, which supplied drinking water to local residents. 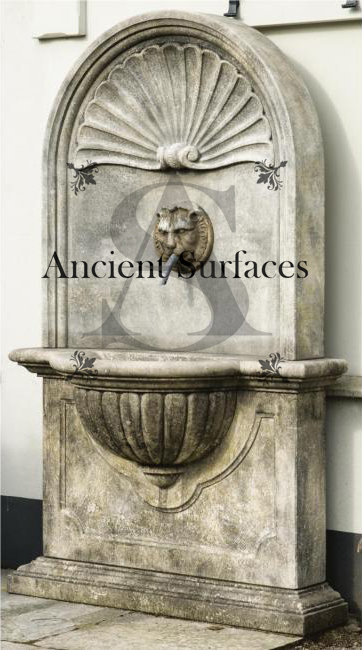 Greek fountains were made of stone or marble, with water flowing through bronze pipes and emerging from the mouth of a sculpted mask that represented the head of a lion or the muzzle of an animal. 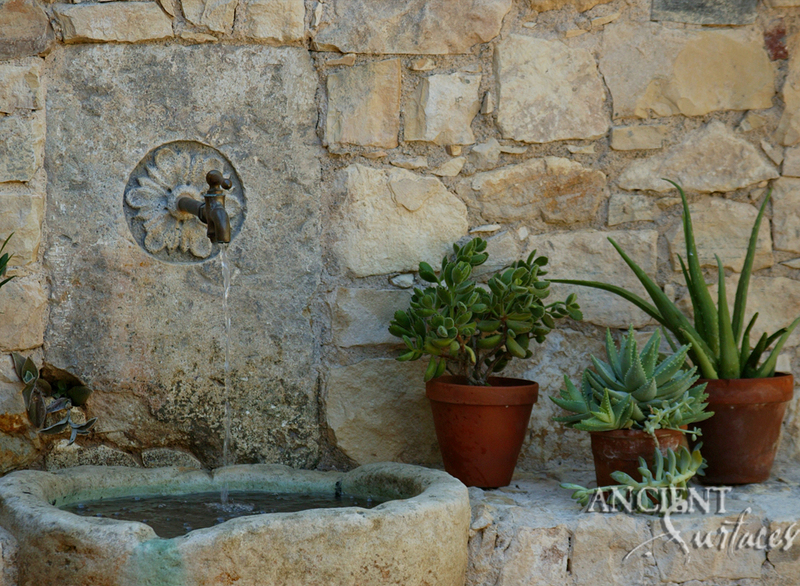 Most Greek fountains flowed by simple gravity, but they also discovered how to use principle of a siphon to make water spout, as seen in pictures on Greek vases. 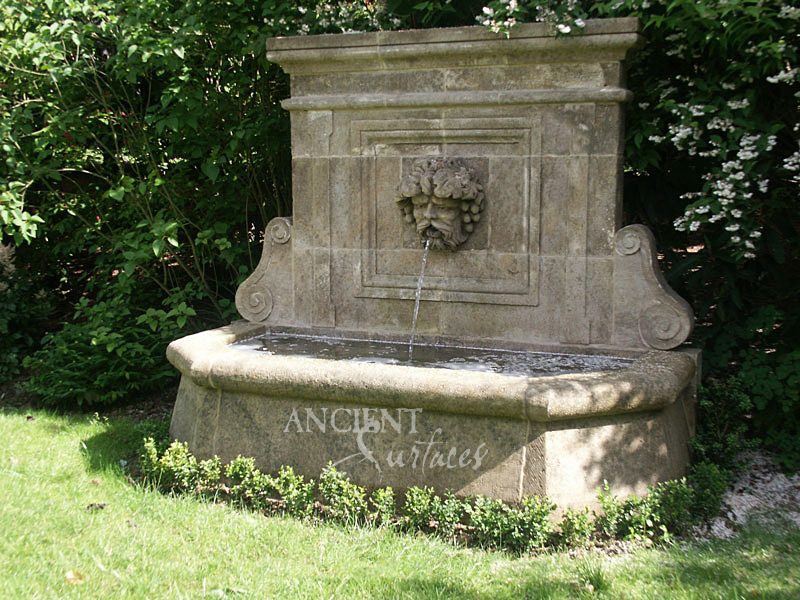 The Ancient Romans built an extensive system of aqueduct from mountain rivers and lakes to provide water for the fountains and baths of Rome. 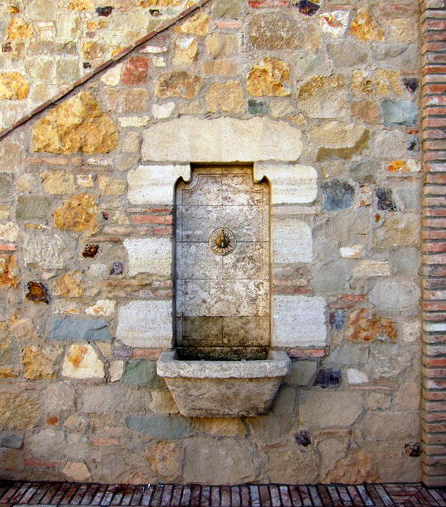 The Roman engineers used lead pipes instead of bronze to distribute the water throughout the city. The excavations at Pompeii, which revealed the city as it was when it was destroyed by Mount Vesuvius in 79 AD, uncovered free-standing fountains and basins placed at intervals along city streets, fed by siphoning water upwards from lead pipes under the street. 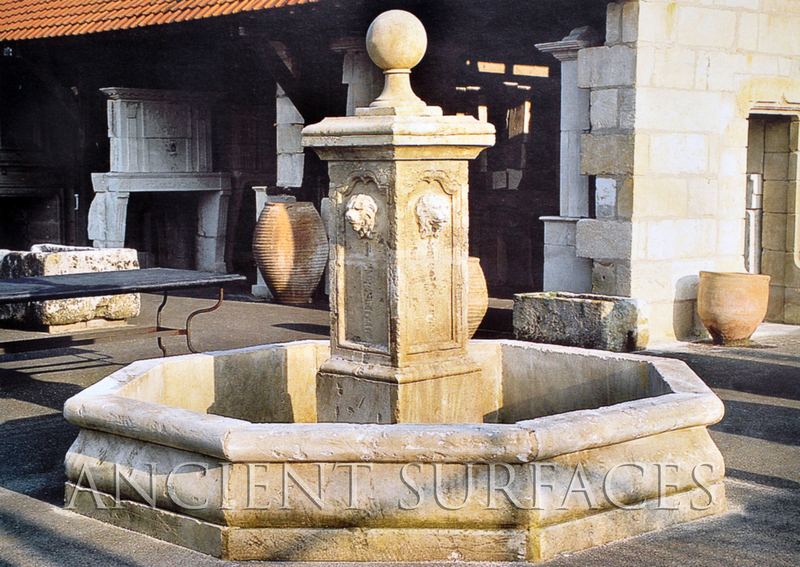 The excavations of Pompeii also showed that the homes of wealthy Romans often had a small fountain in the atrium, or interior courtyard, with water coming from city water supply and spouting into a small bowl or basin. 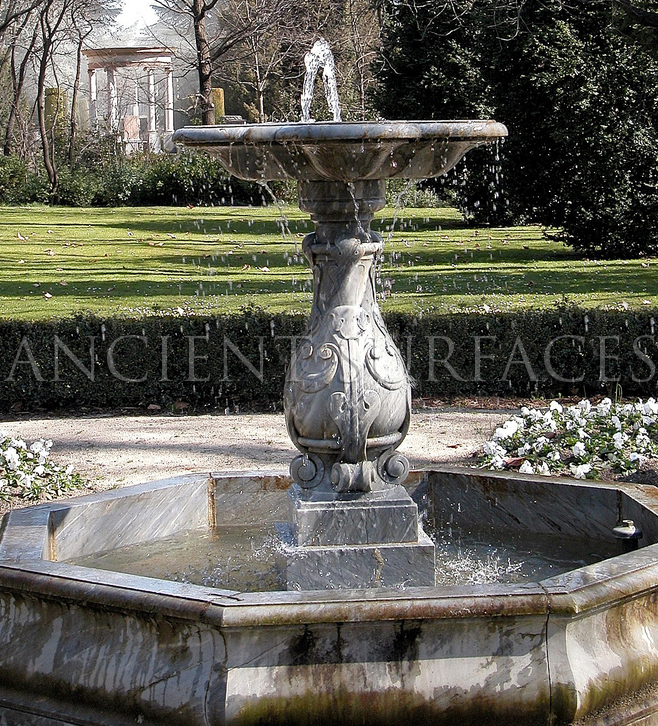 Ancient Rome was a city of fountains. 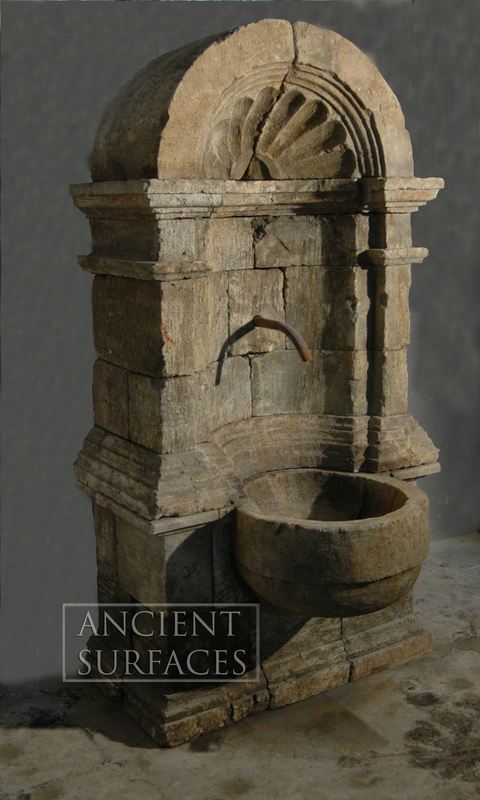 According to Sextus Julius Frontinus, the Roman consul who was named curator aquarum or guardian of the water of Rome in 98 AD, Rome had nine aqueducts which fed 39 monumental fountains and 591 public basins, not counting the water supplied to the Imperial household, baths and owners of private villas. 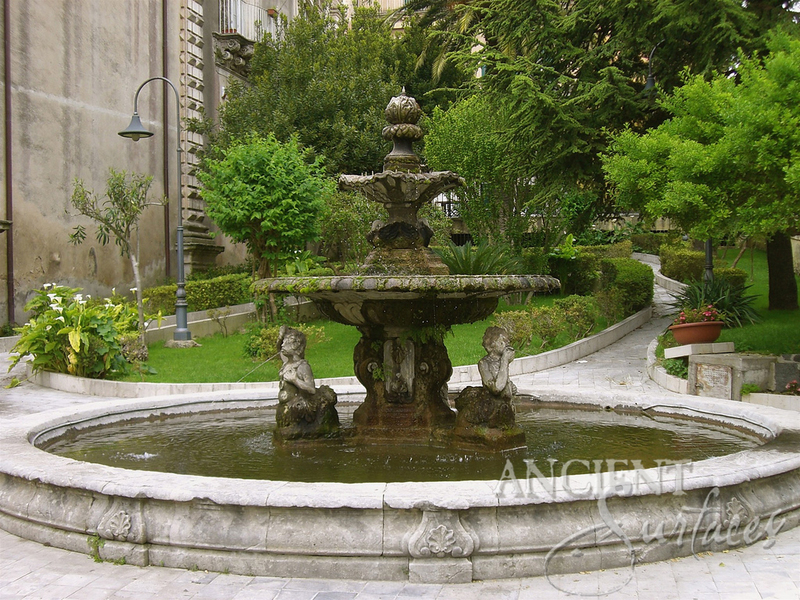 Each of the major fountains was connected to two different aqueducts, in case one was shut down for service. 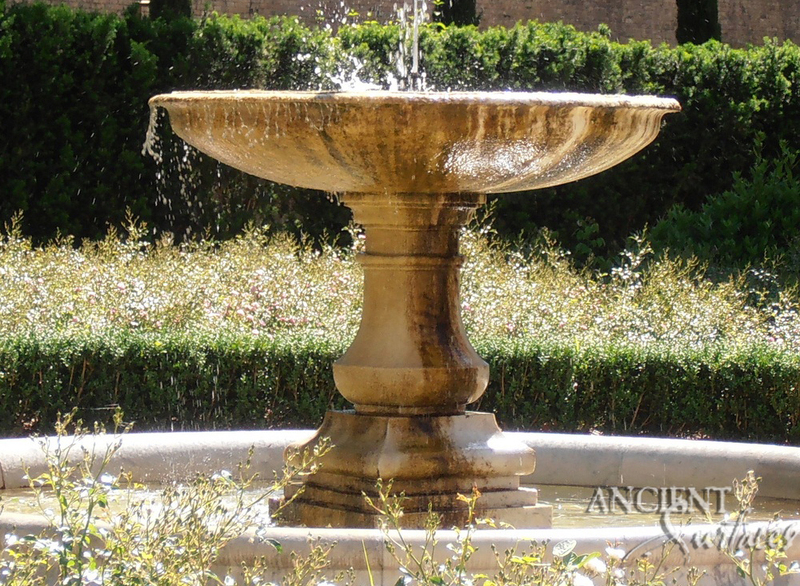 The Romans were able to make fountains jet water into the air, by using the pressure of water flowing from a distant and higher source of water to create hydraulic head, or force. 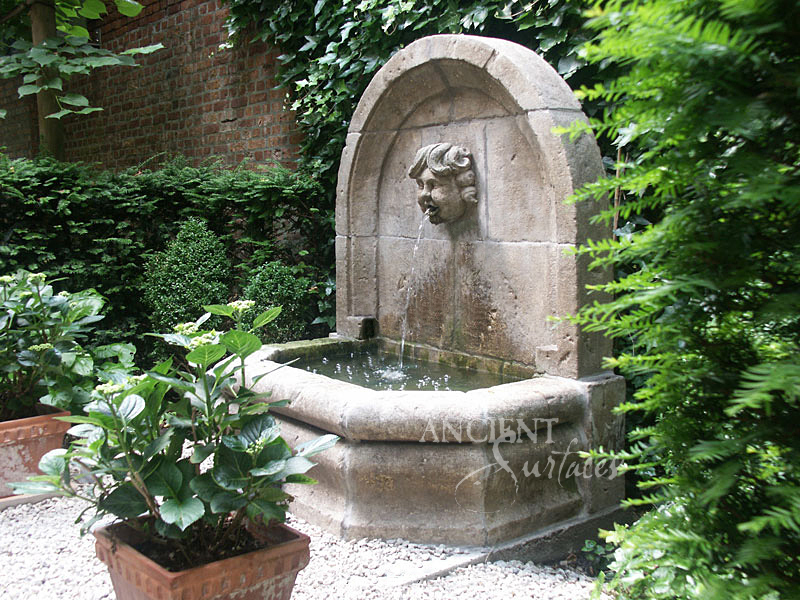 Illustrations of fountains in gardens spouting water are found on wall paintings in Rome from the 1st century BC, and in the villas of Pompeii. The Villa of Hadrian in Tivoli featured a large swimming basin with jets of water. 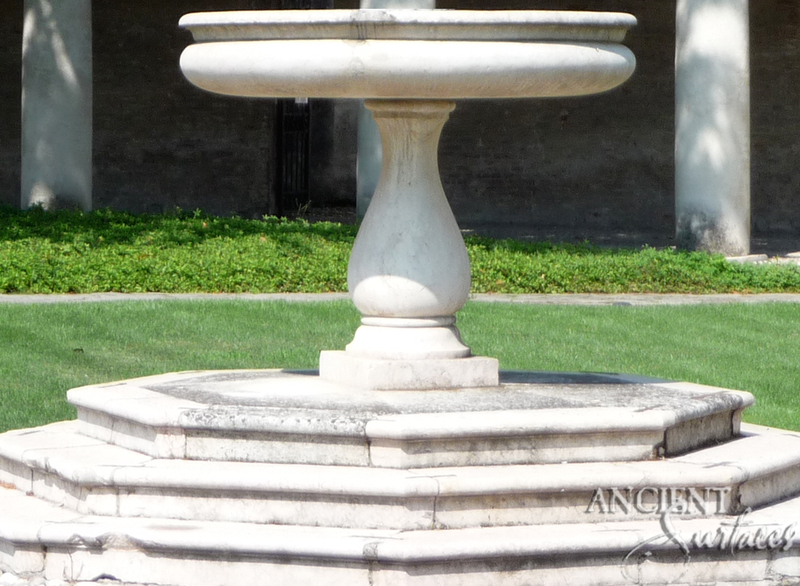 Pliny the Younger described the banquet room of a Roman villa where a fountain began to jet water when visitors sat on a marble seat. 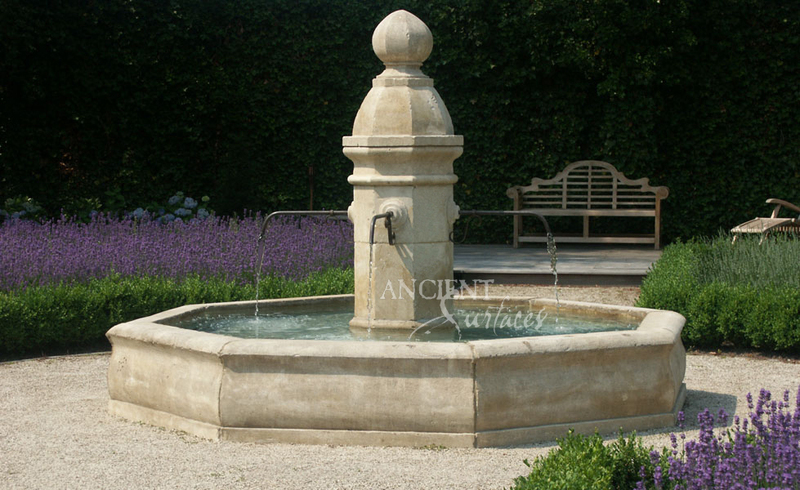 Roman engineers built aqueducts and fountains throughout the Roman Empire. 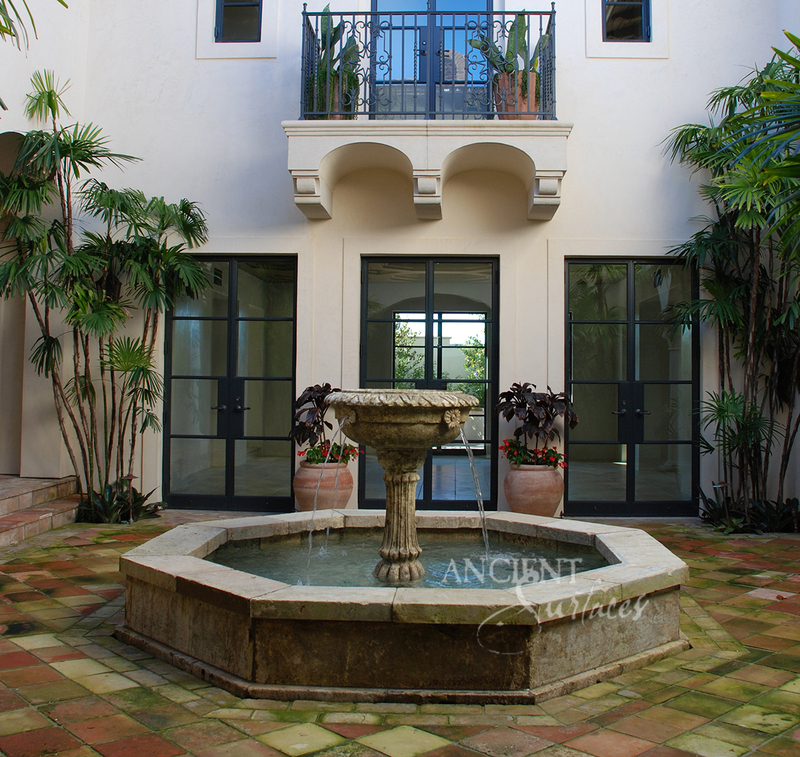 The most important characteristic of courtyard design is enclosure. 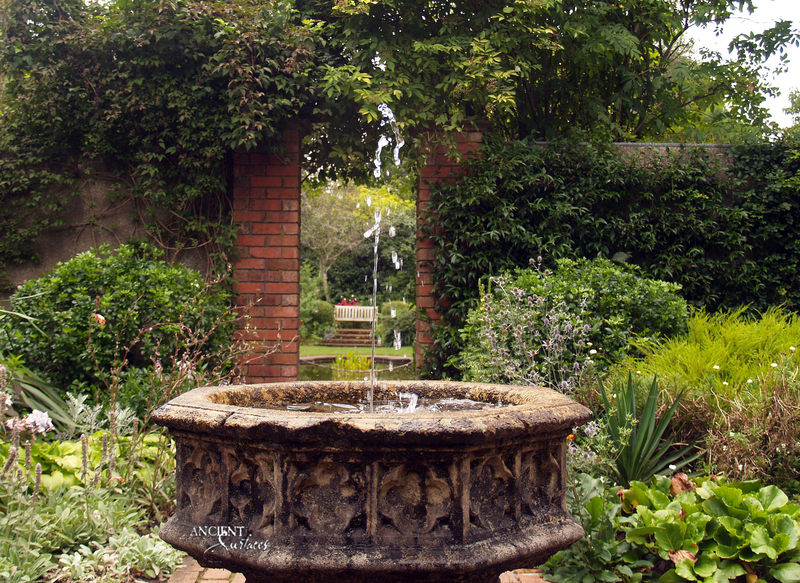 A courtyard can be enclosed with walls, fencing or even plants. 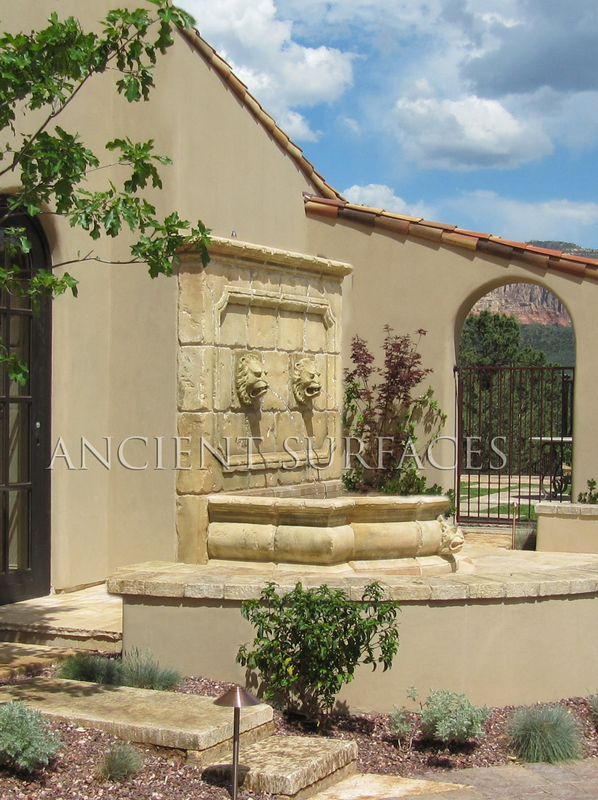 Depending on the level of privacy you desire, the walls of a courtyard can be tall or short, solid or transparent. ‘Foundation Slabs’ on the Pool Coping Edge. 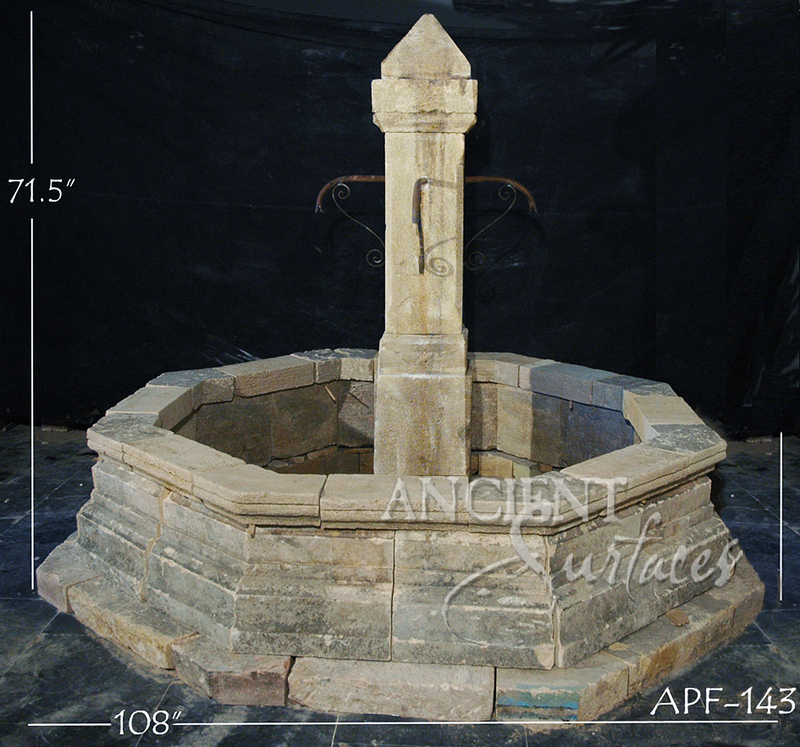 Antique tiered stone fountain by Ancient Surfaces. 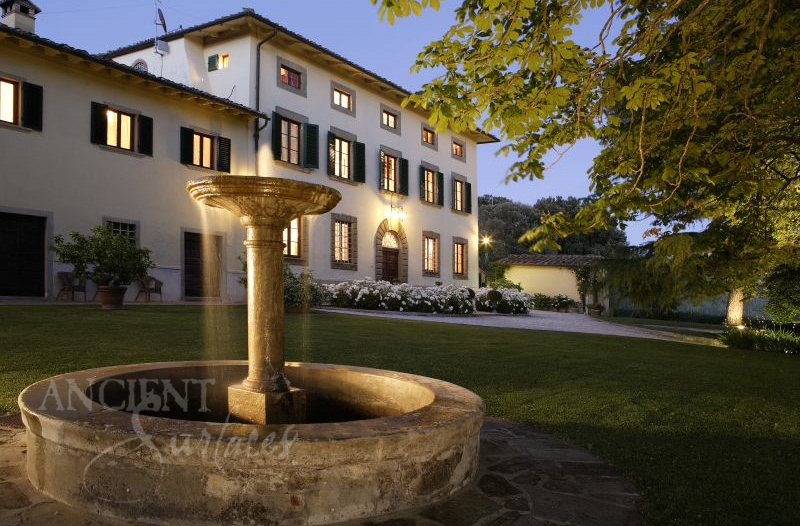 Photo of a hotel exterior garden with lawn. 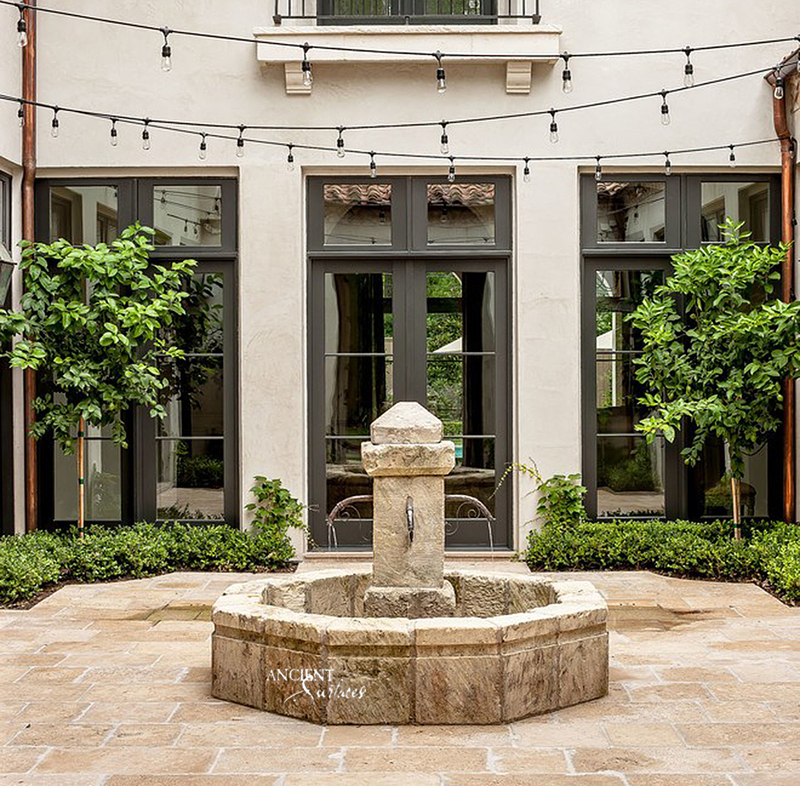 Enclosing a courtyard on all four sides is not always a requirement – typically three sides will be sufficient for creating a sense of enclosure. 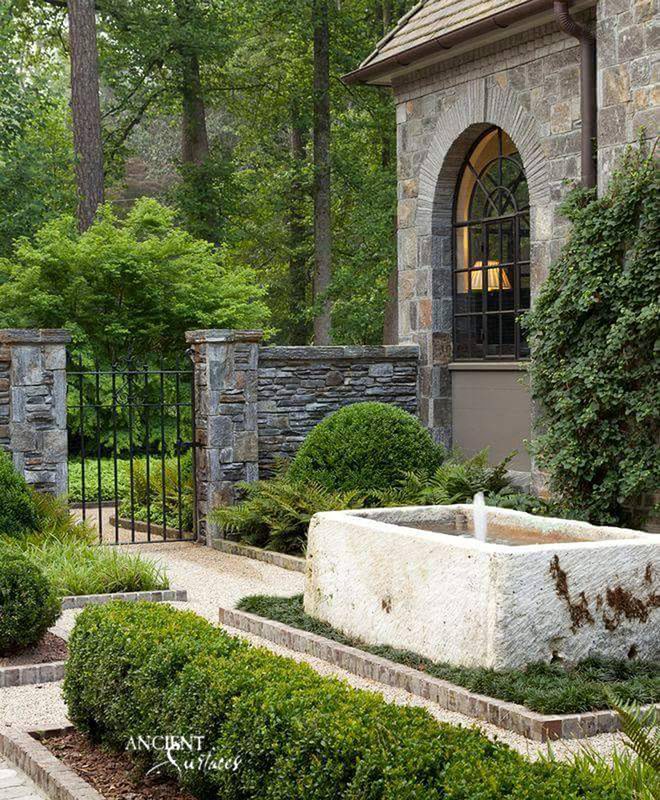 In order to avoid a fortress-like appearance, many homeowners opt to use low walls or partially see-through fencing padded with a line of thick foliage shrubs or trees. 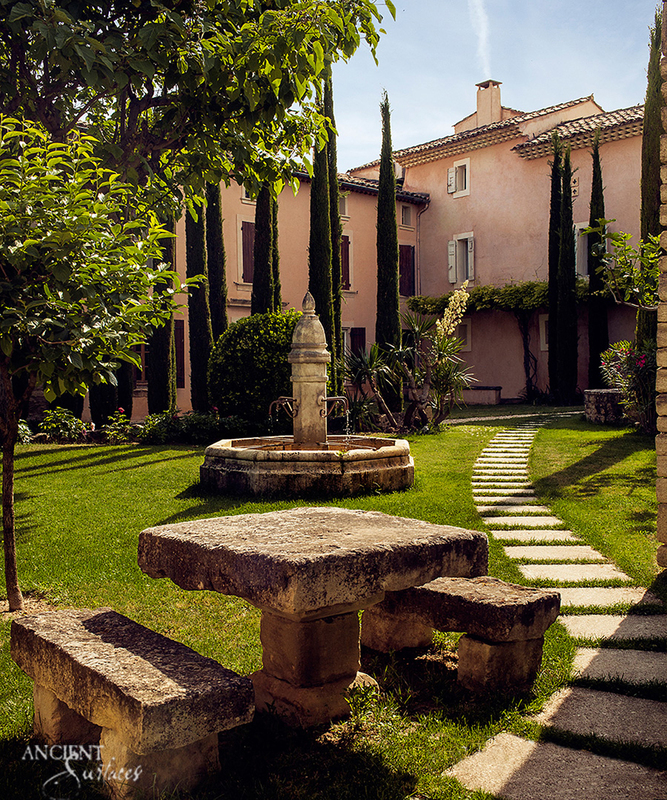 This helps create a sense of greenery and intrigue while welcomes visitors, yet providing privacy for courtyard activities. 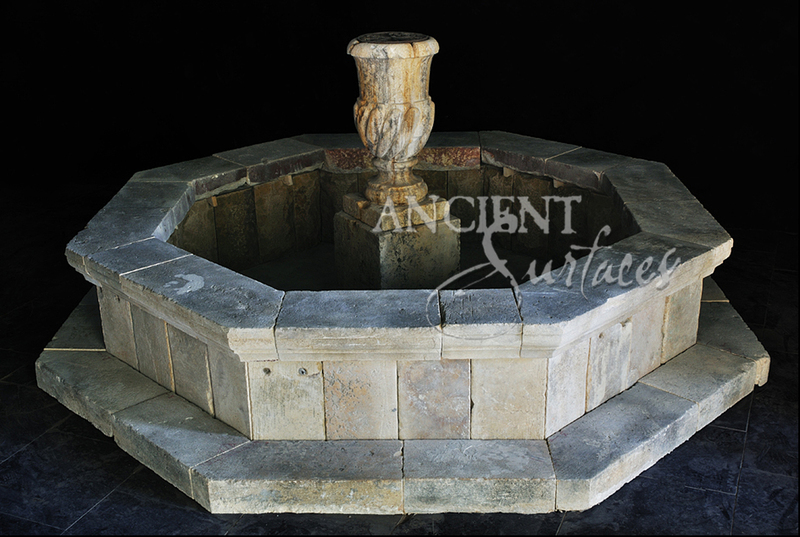 An Octagonal antique Limestone Pool Fountain By Ancient Surfaces in an Irvine California Home. 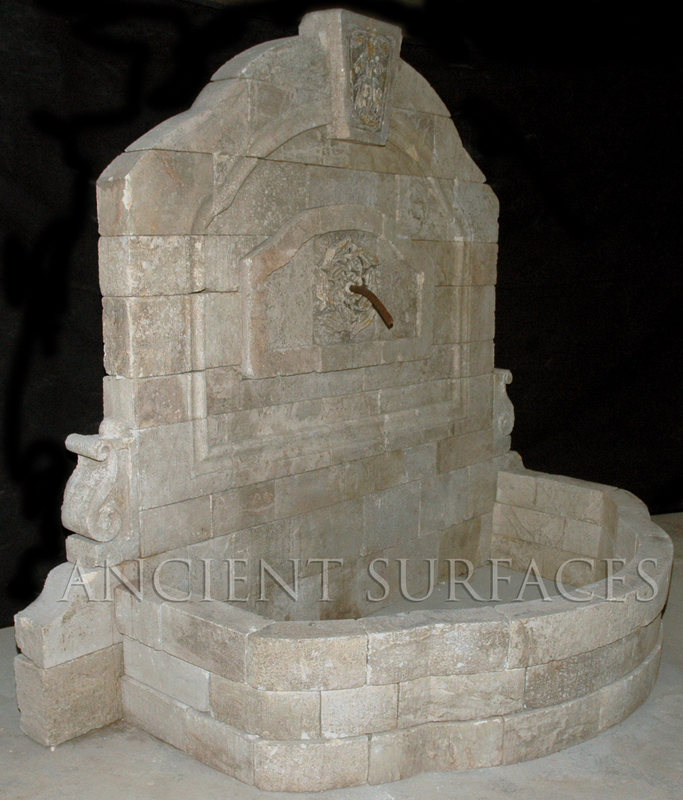 Octagonal Antique Limestone Pool Fountain by Ancient Surfaces. 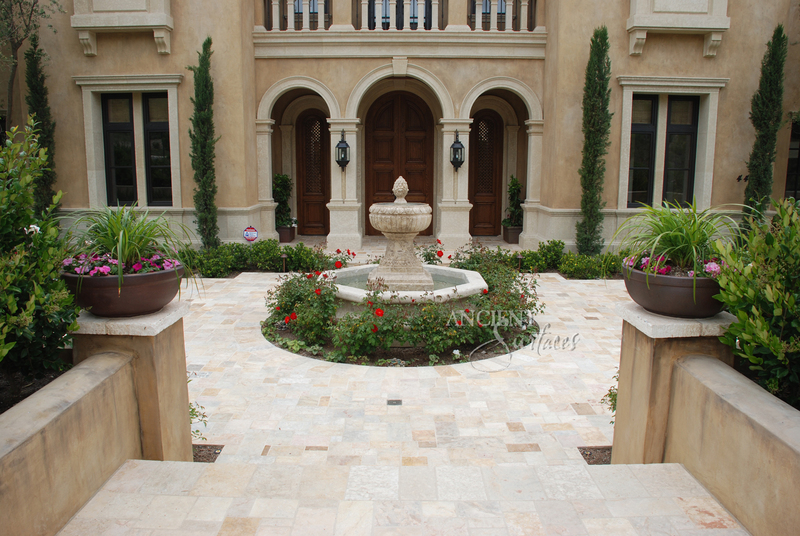 A semi closed courtyard in California. 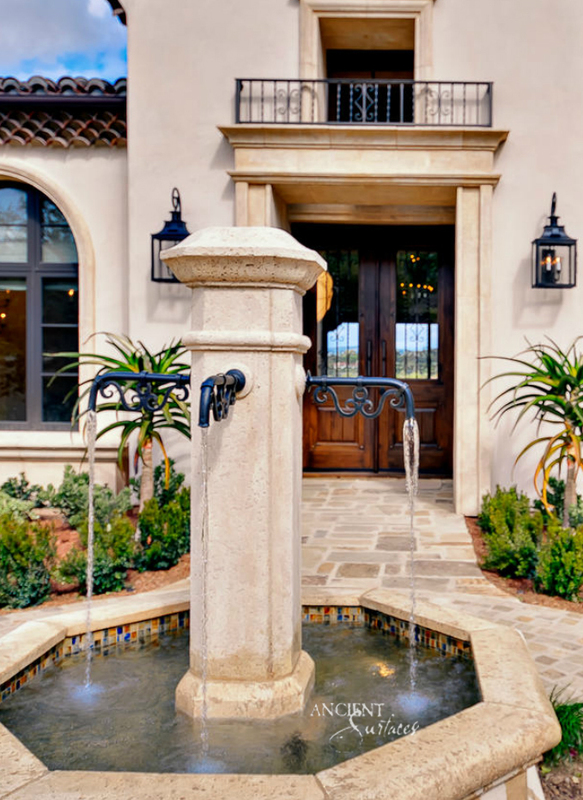 A front courtyard would not be complete without a water feature. 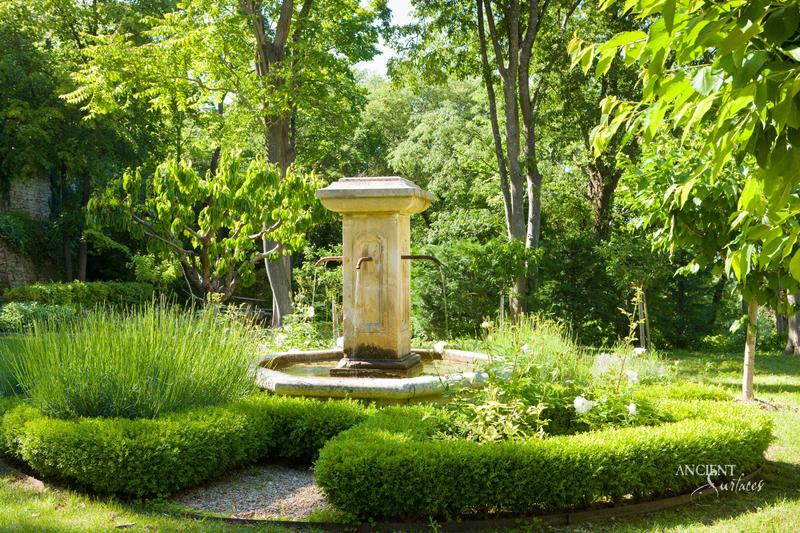 The sound of moving water will help to mask ambient noises such as traffic and neighbors. 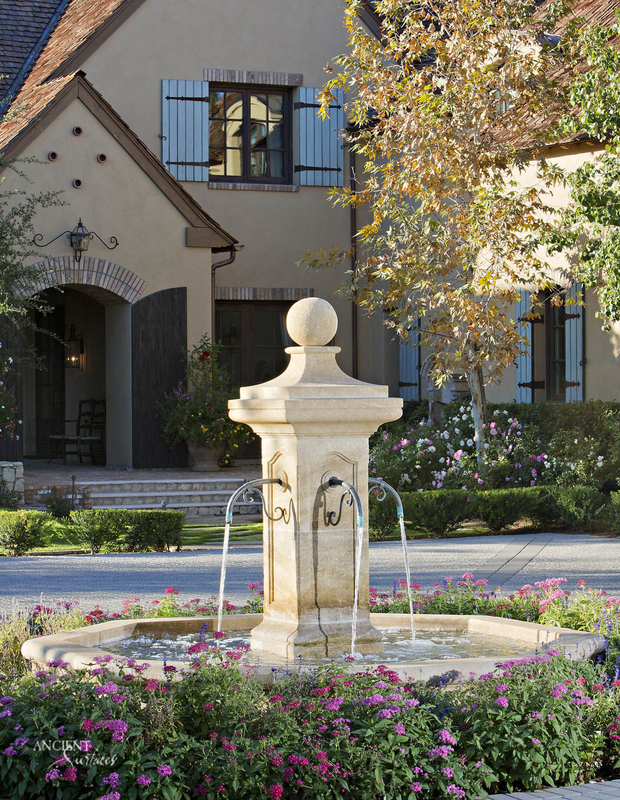 In a formal courtyard design a classically styled fountain can serve as a centerpiece, while in an informal courtyard a wall, or disappearing urn fountain will do the trick. 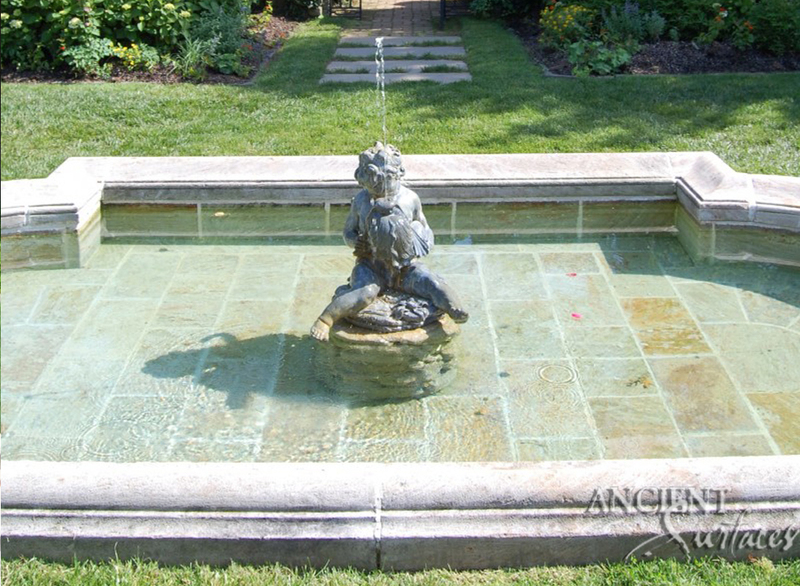 The size of a water feature should be proportionate to the size of the courtyard. 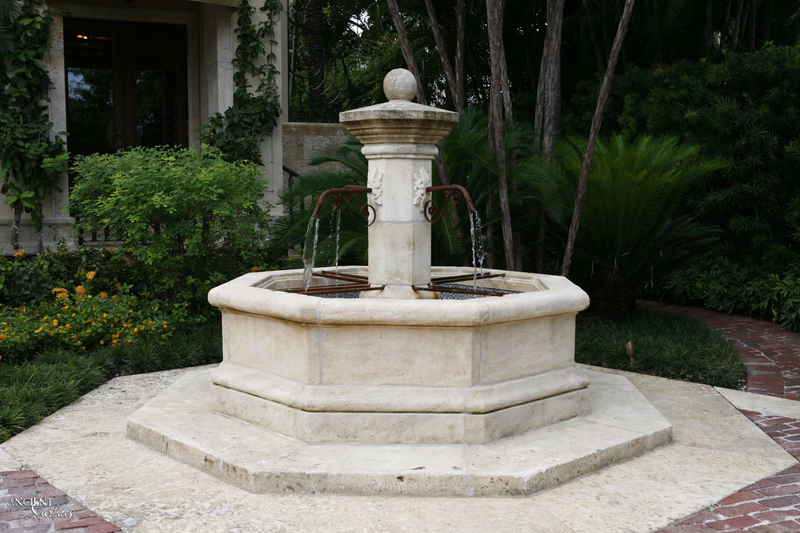 For example, a large tiered fountain will visually overpower a small courtyard and produce too much noise for the space. 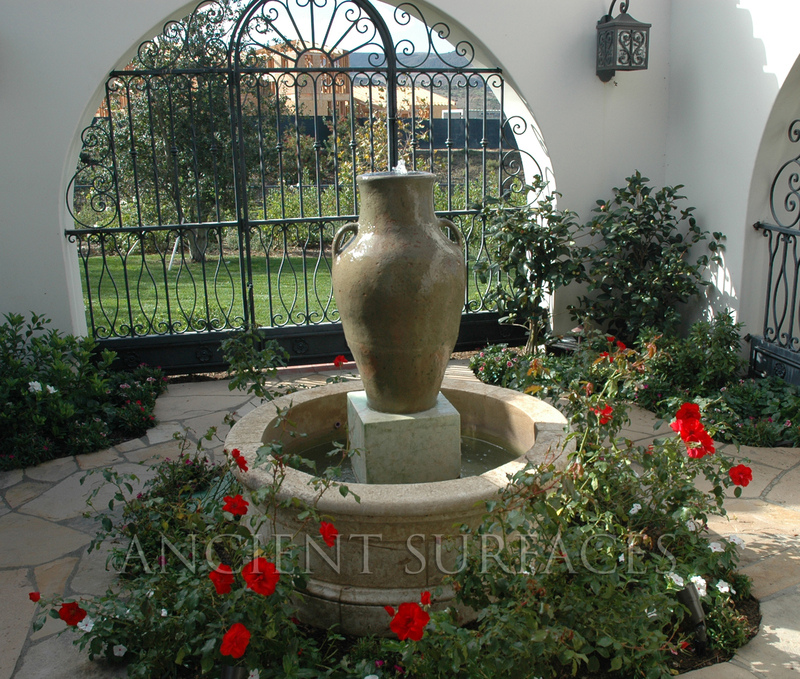 A landscape designer or architect will be able to help you determine the proper scale for your courtyard water feature. 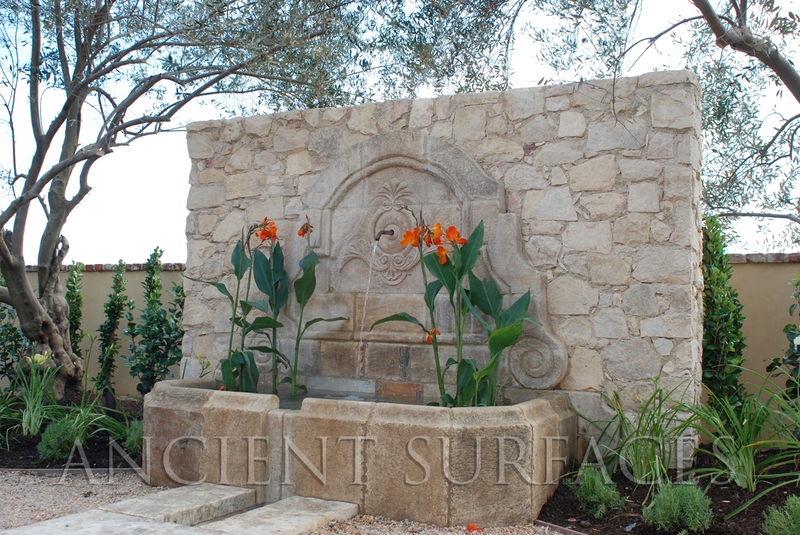 Small Antique French Limestone Wall Fountain installed in a small courtyard. 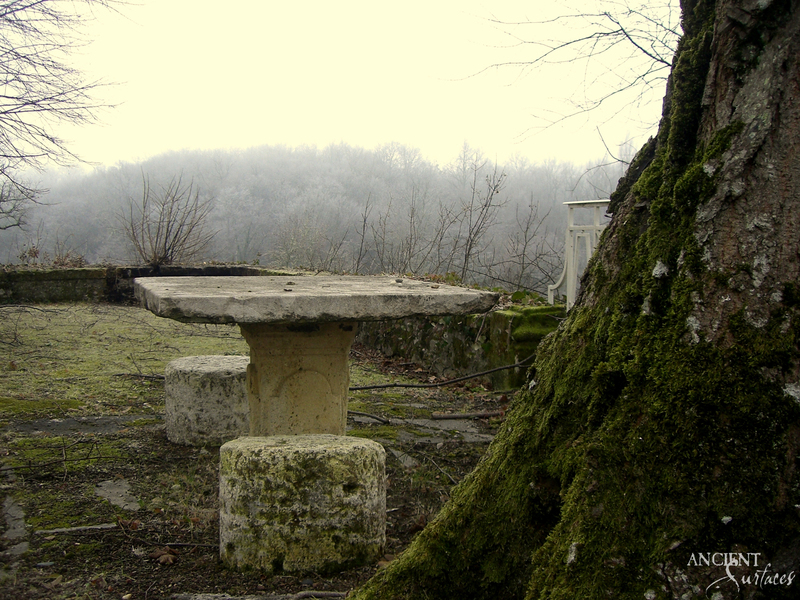 By Ancient Surfaces. 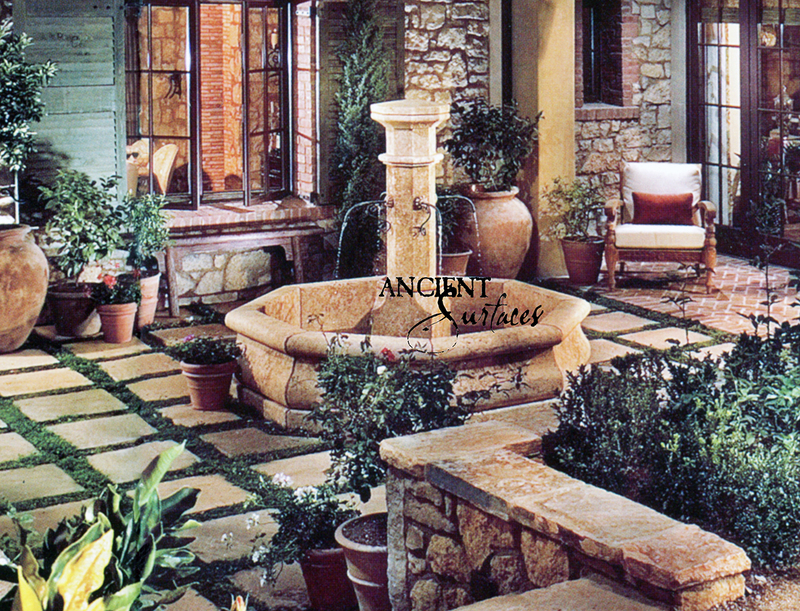 Outdoor Courtyard with heavy foliage, a wall fountain and an outdoor dining table by Ancient Surfaces. 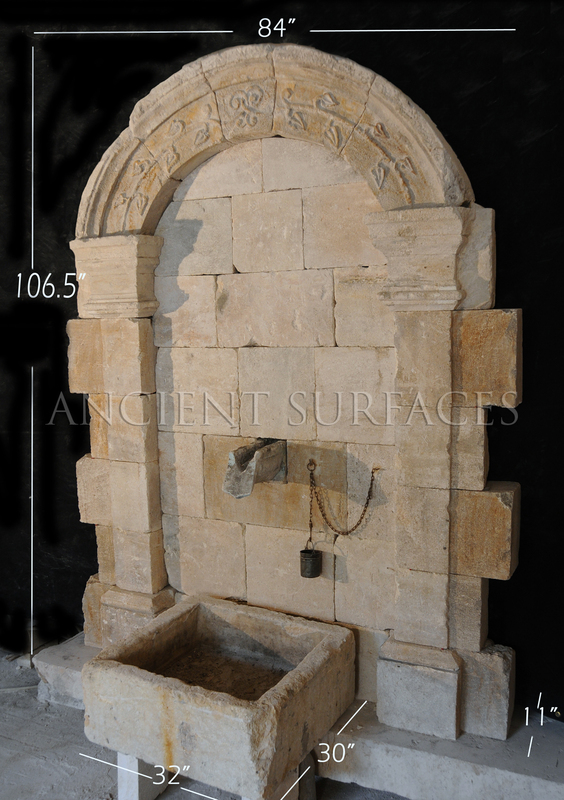 Hand Carved Limestone Classical Wall Fountain in an Exposed Open Inside Courtyard By Ancient Surfaces. 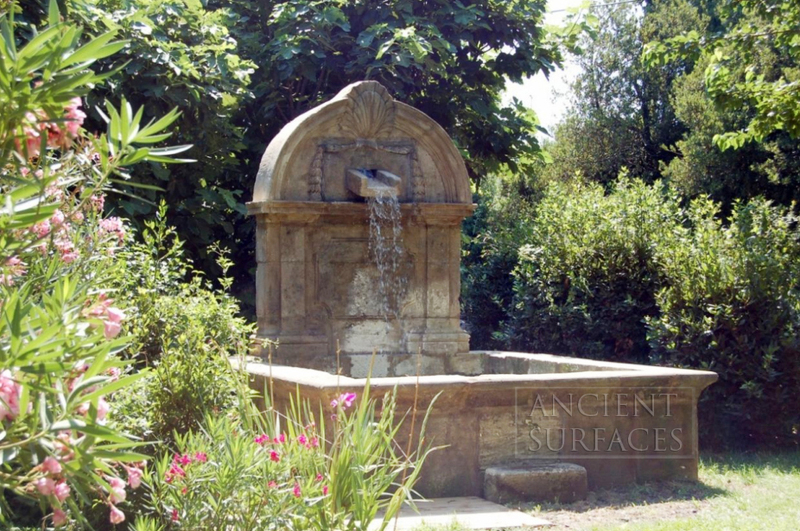 The Ancient Romans built an extensive system of acqueducts from mountain rivers and lakes to provide water for the fountains and baths of Rome. 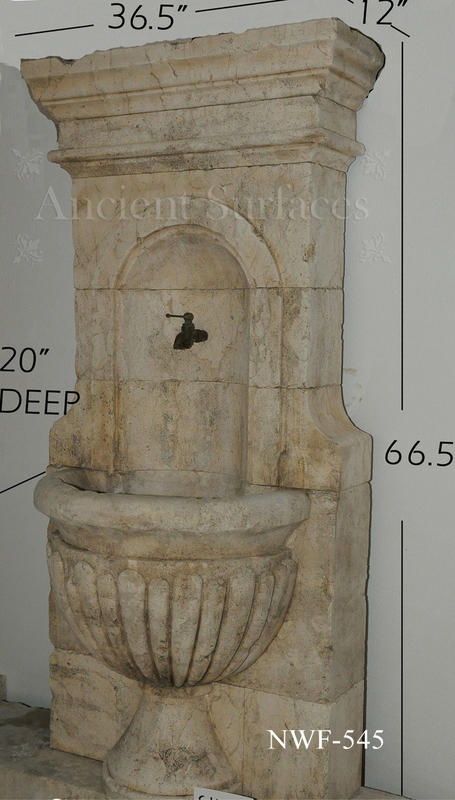 A 17th Century Antique Wall Fountain by Ancient Surfaces. 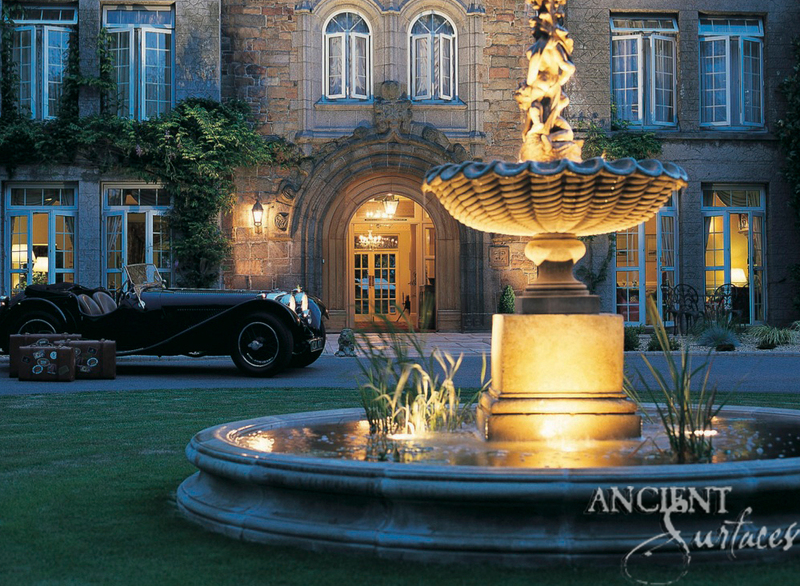 A life long dedication to quality architectural stone products beyond belief. 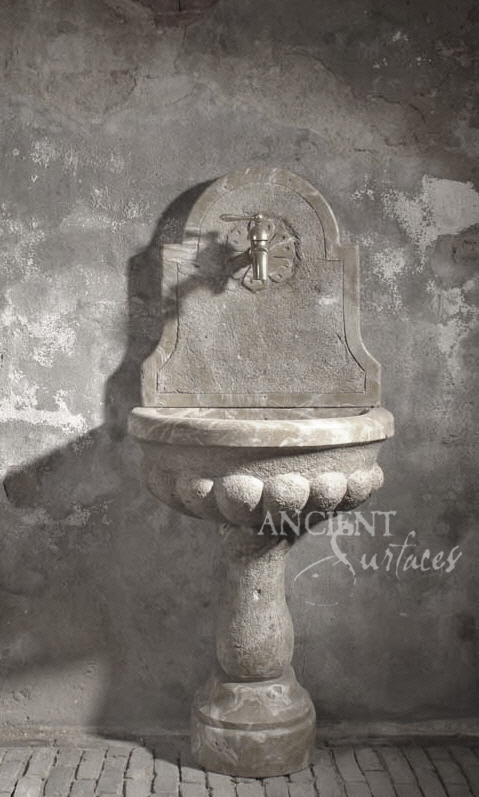 A 19th Century Antique Wall Fountain by Ancient Surfaces. 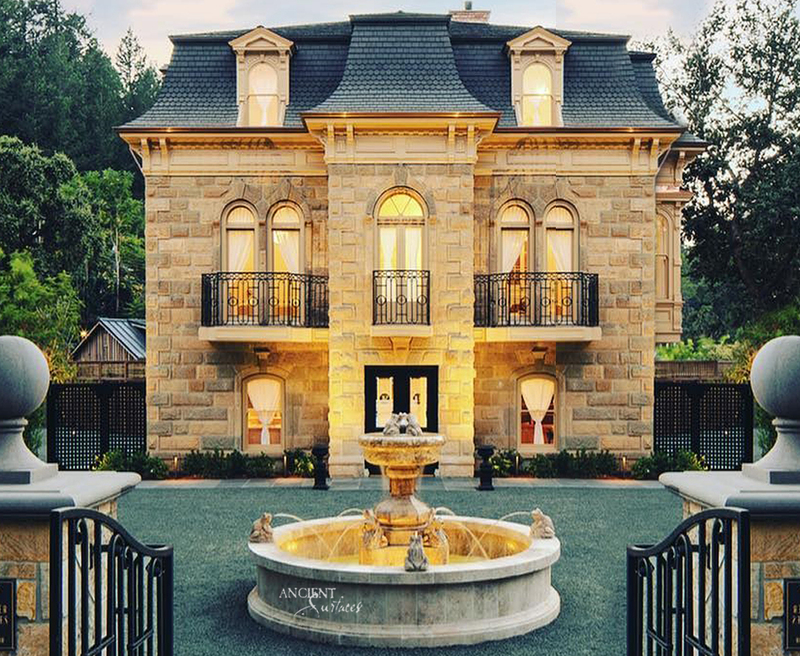 A life long dedication to quality architectural stone products beyond belief. 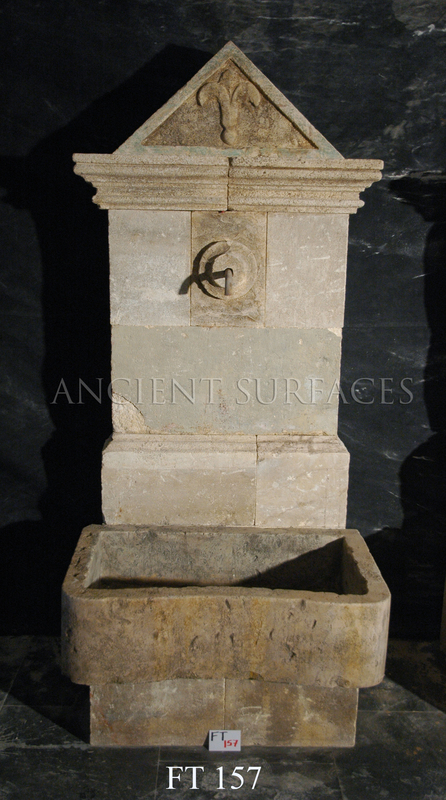 An Antique Salvaged Wall Fountain by Ancient Surfaces. 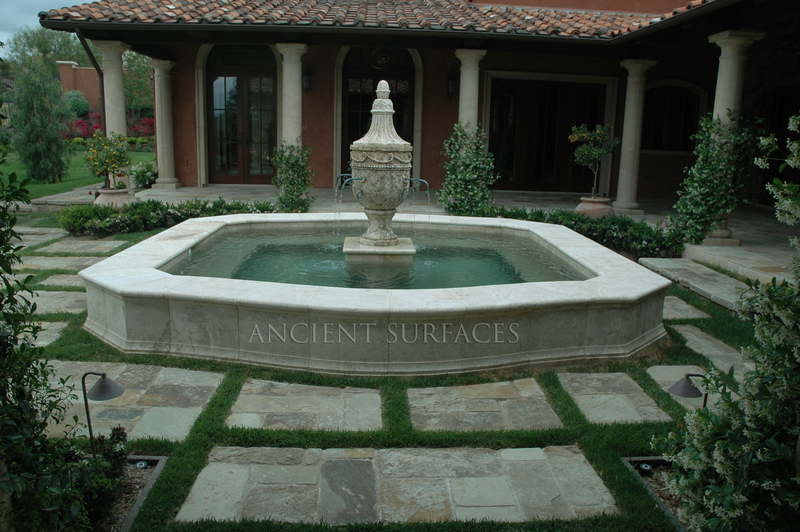 A life long dedication to quality architectural stone products beyond belief. 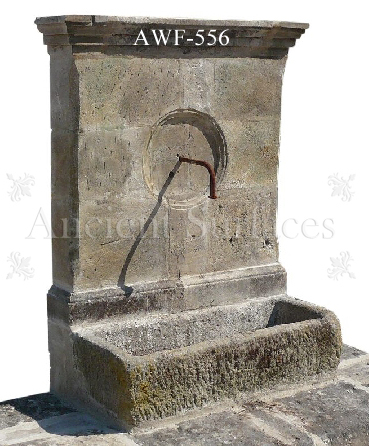 A unique antique stone wall fountain. 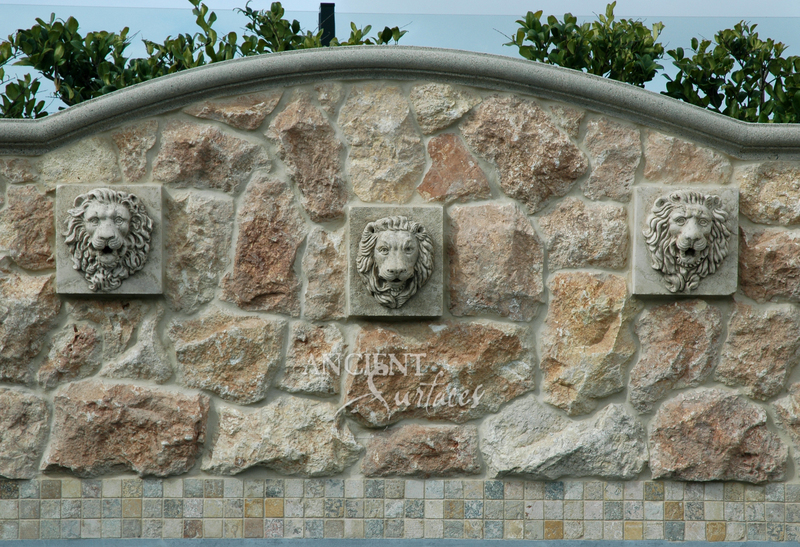 A life long dedication to quality architectural stone products beyond belief. 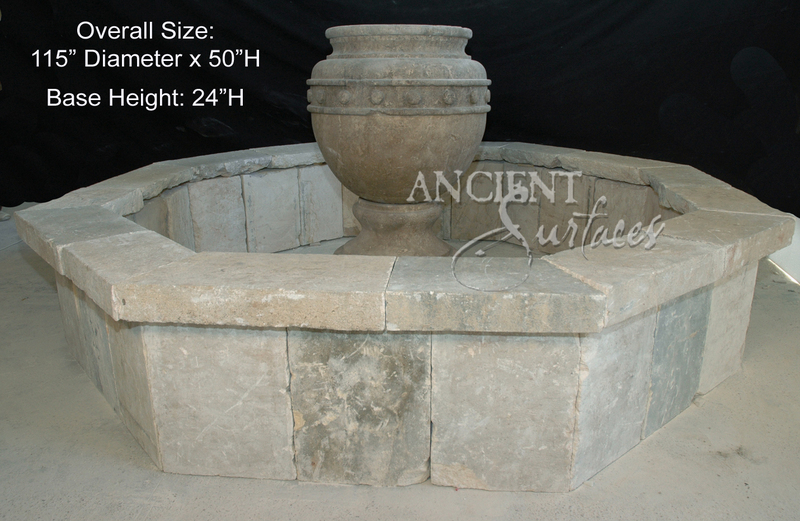 Are you ready to set the crown jewel of your backyard yet? 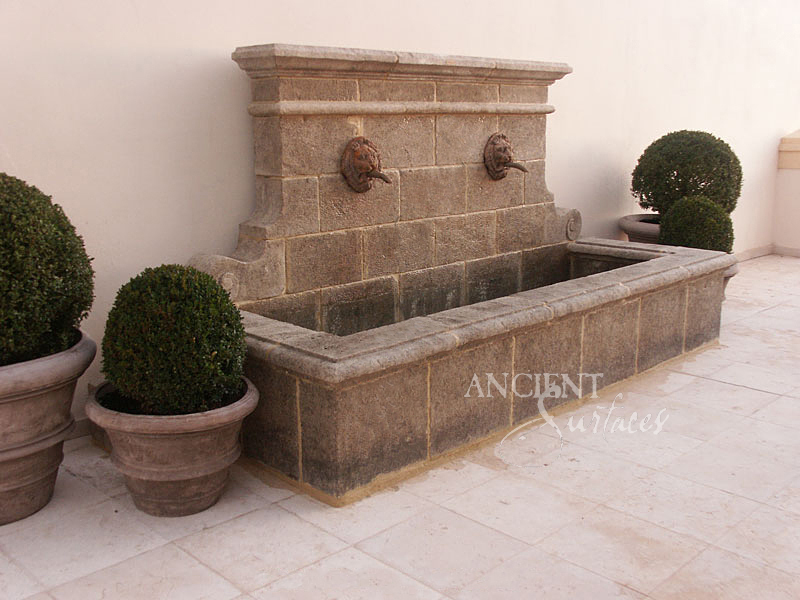 Or maybe you just want to finish of your swimming pool with a hand carved stone art piece instead of that stone stacked, bricked or stuccoed wall that you’re tired of? 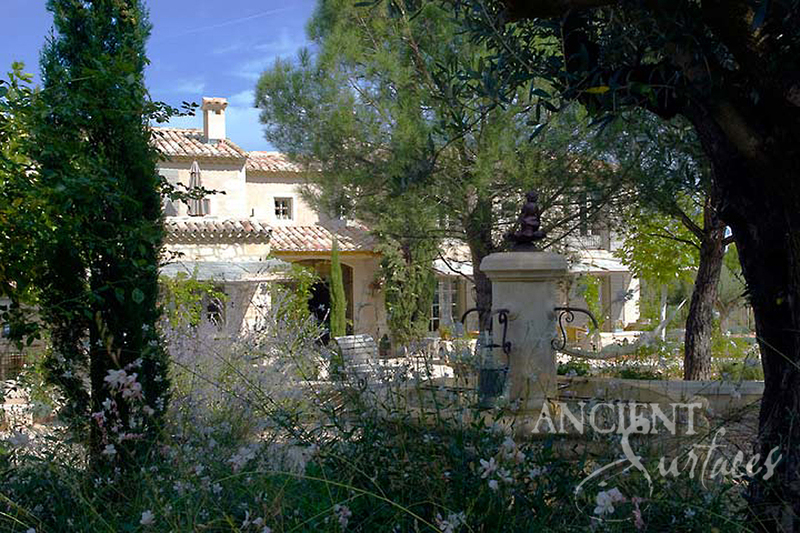 Have you been thinking of creating an architectural focal point amidst all your plant foliage and trees so you can improve your outdoor setting? What about that kitchen window that leads to your neighbor’s wall or catwalk?! 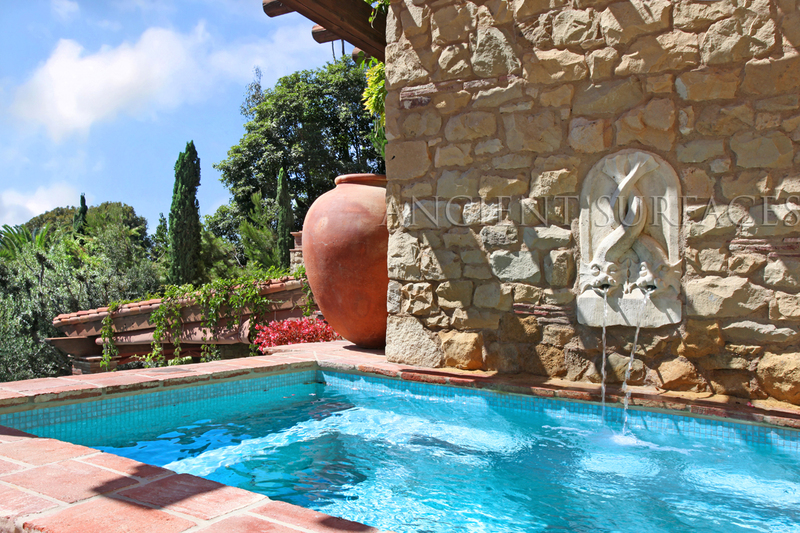 Unlock the full potential of your outdoor living space and experience what the Italian call the ‘Al Fresco’ lifestyle or the outdoor living lifestyle as you optimize your health by surrounding yourself with the elements of nature, soil, water, air and fire.